No one on hand for the opening round of the Larry McIntire Board 130 Classic would tell you otherwise. 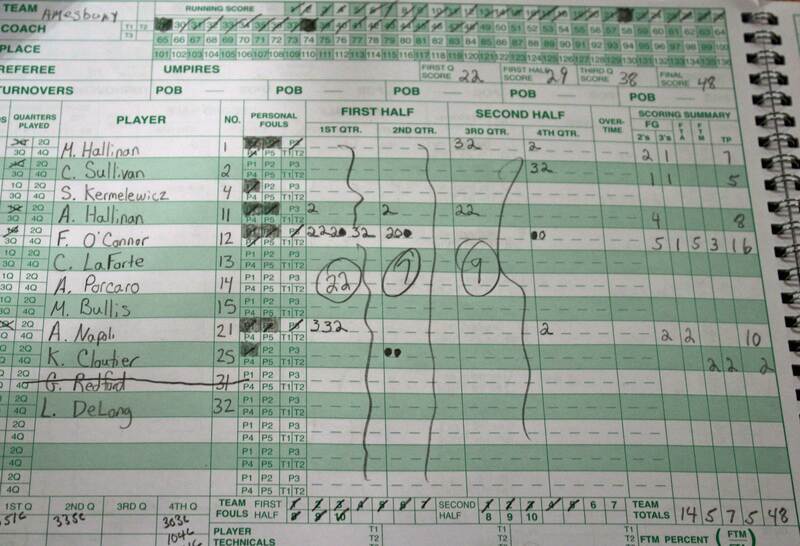 The Chieftains (16-5) defeated Beverly, 73-20. 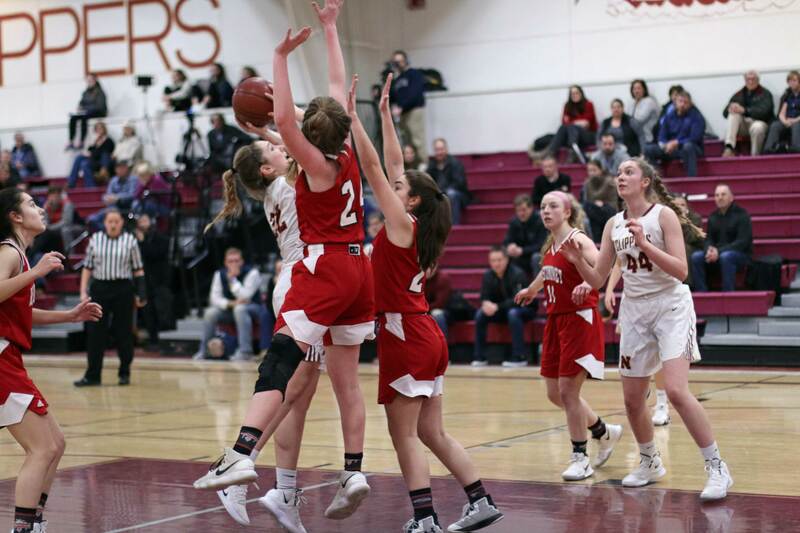 Note that I didn’t write, “humiliated,” because the Masco coaching staff was quick to pull starters, call off pressure, and curb fast breaks in a game that went totally south in the second half. 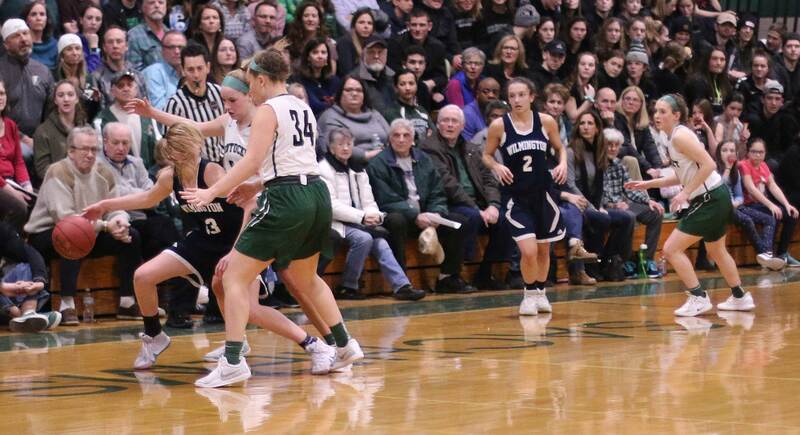 The obvious attempts to lessen the point disparity weren’t completely successful because each new layer of Chieftain players could play defense and put up points at the end of lengthy possessions. 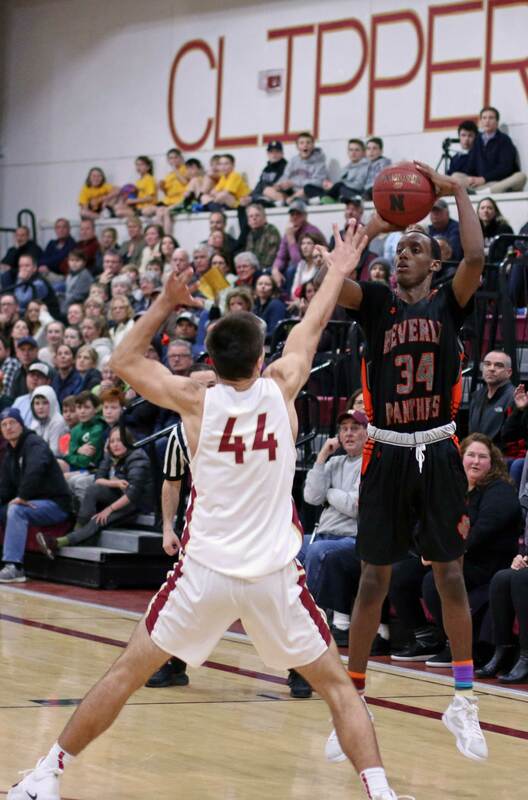 Beverly (9-10) will have their final chance tomorrow to get the win (against Revere) to qualify for the tournament. 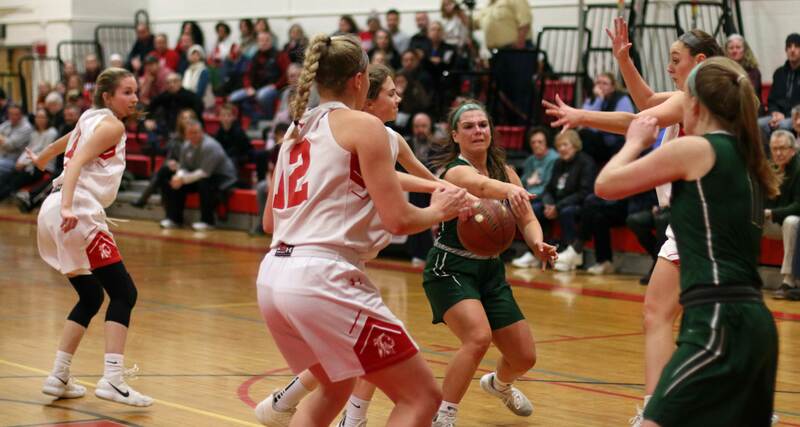 The Chieftains are coming off wins over two of the Cape Ann League’s best teams; Amesbury and Pentucket. 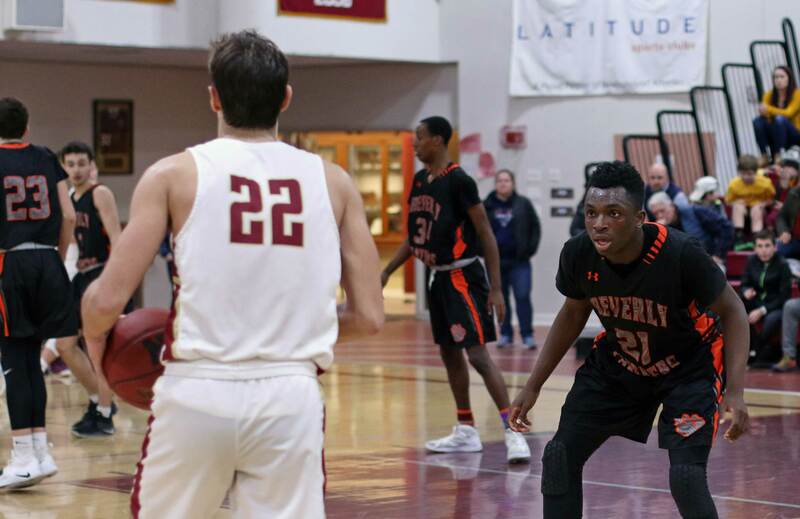 The Chieftains pressed full-court but it was in the half-court where they gave Beverly the most trouble. 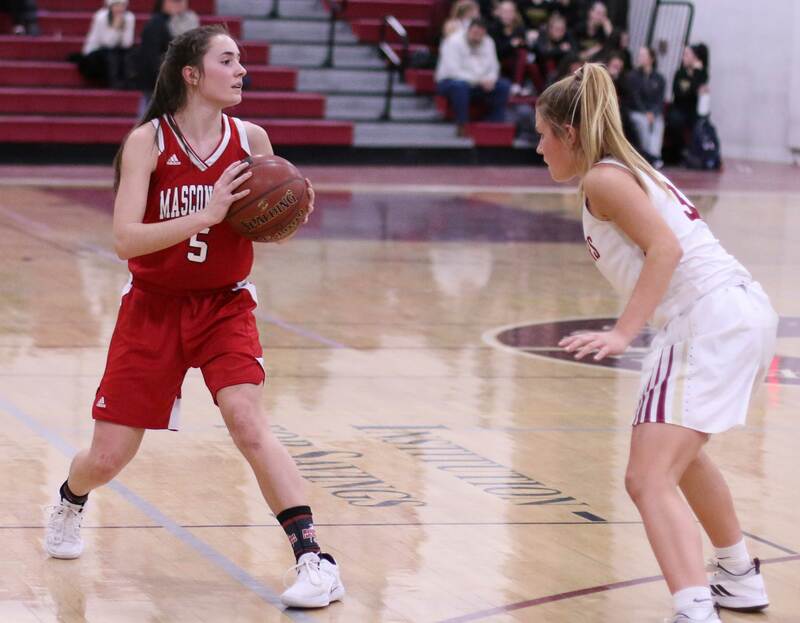 After a full-court layup by Sabrina Beaudry (10 points) Masco tallied the next twelve points in the first period to break loose, 16-2. 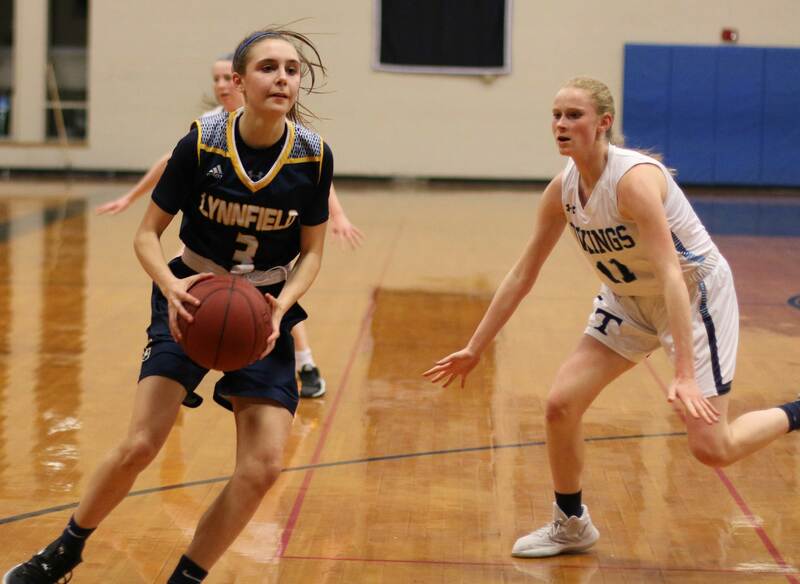 Junior Mak Graves (22 points) dominated in this segment getting two regular three’s, as well as an old-fashioned three-point play. 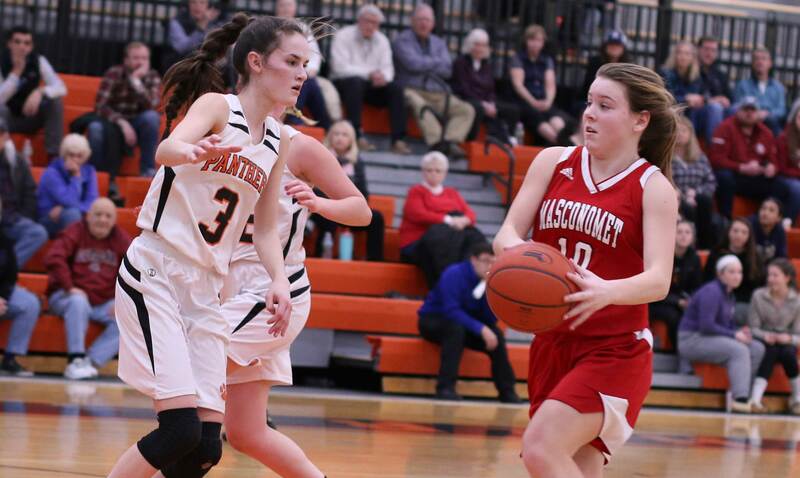 The Panthers couldn’t penetrate the Masco defense for close-in shots. 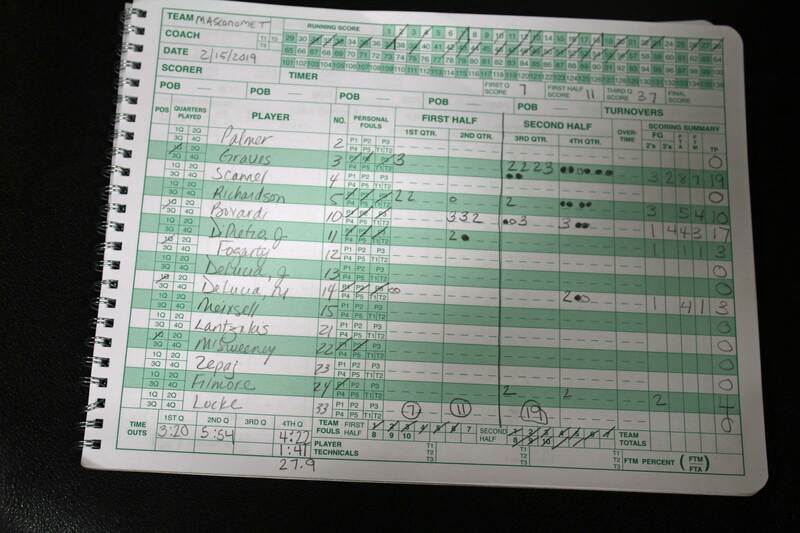 The best they could get were from beyond the arc and there was little good (1-for-19) to be found for them out there. 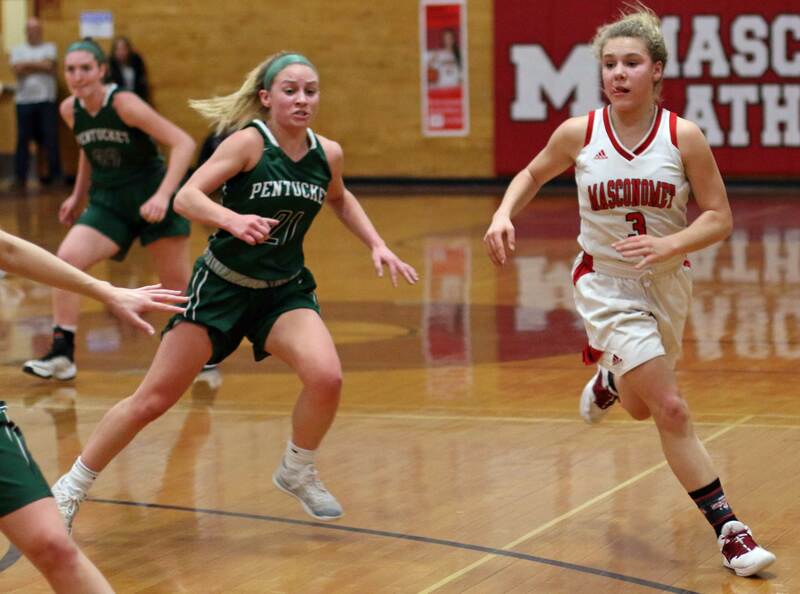 The Chieftains had their fast break working and were extremely effective when they had to run an organized offense in the half court. 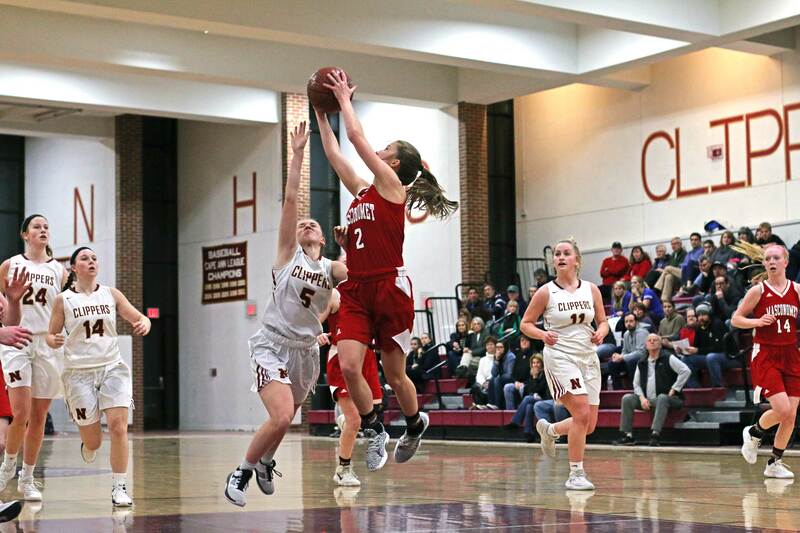 Credit Beverly because after 4 ½ minutes in the second period the Masco lead was only, 23-10. After that the wheels came off entirely for Beverly. 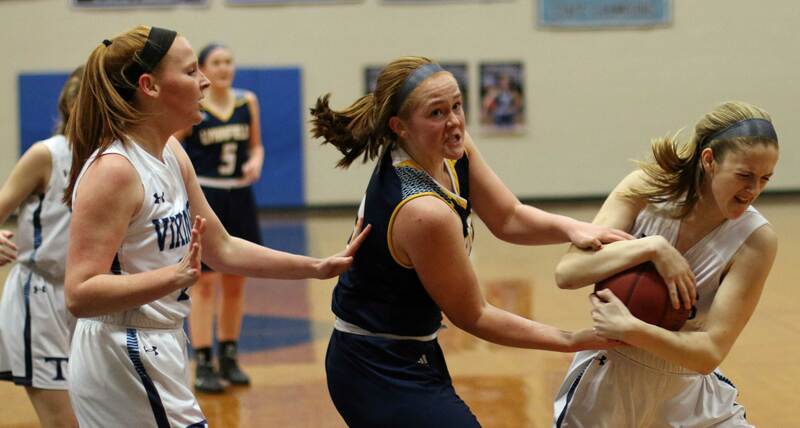 Most sports have ways to shorten games that get out of hand, but basketball doesn’t. The next 14 ½ minutes of playing time in today’s game would suggest that it should be considered. 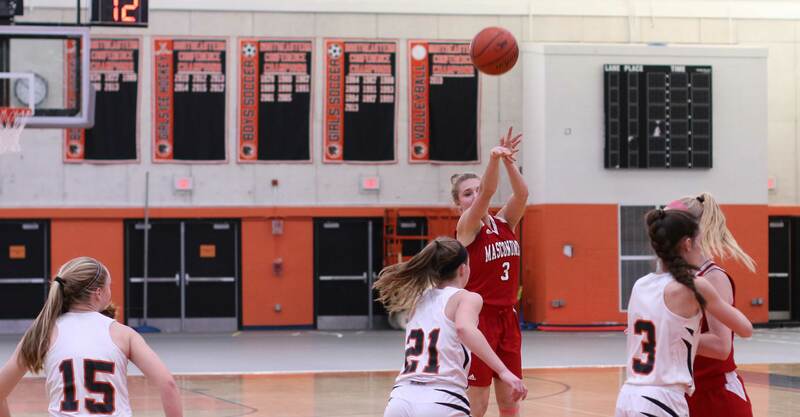 Masco outscored Beverly 39-2 during those 14 ½ minutes! Sabrina Beaudry had Beverly’s only basket during the disastrous segment. 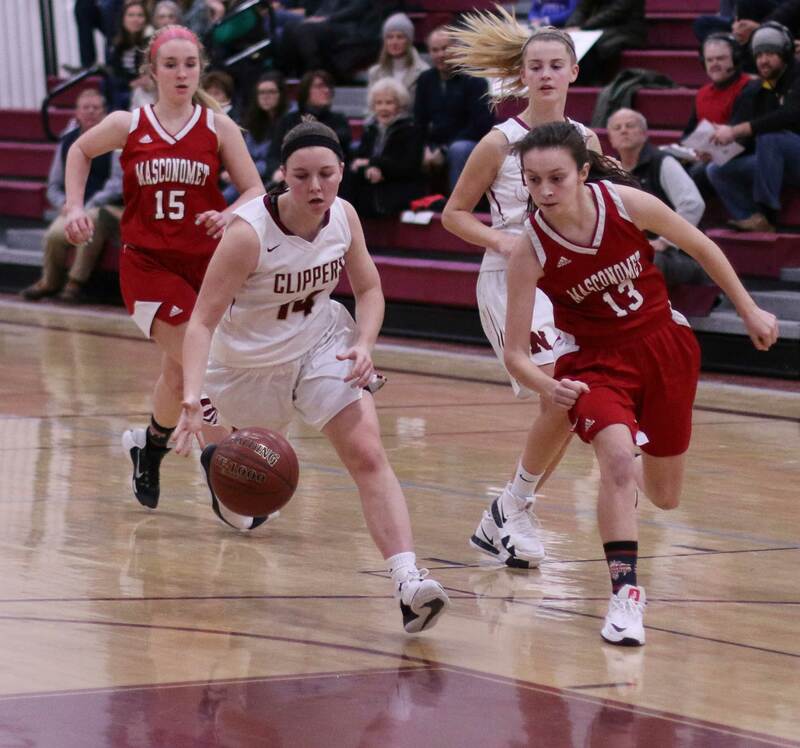 Senior Marissa DeLucia had ten rebounds, four assists, and four steals for the Chieftains. Morgan Bovardi ended with twelve points. 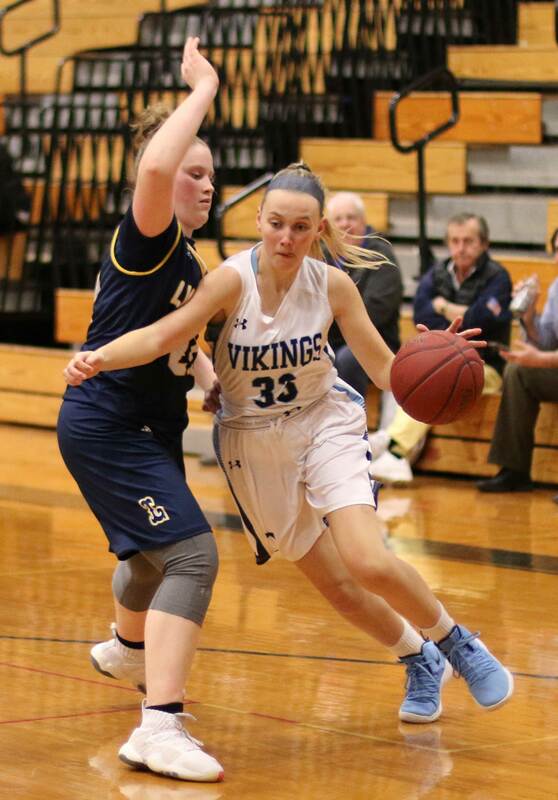 Mak Graves, Morgan Bovardi, and Paige Richardson were informed recently that they are Cape Ann League All-Stars. There was actually natural light in the Beverly High School gym today for this afternoon event. 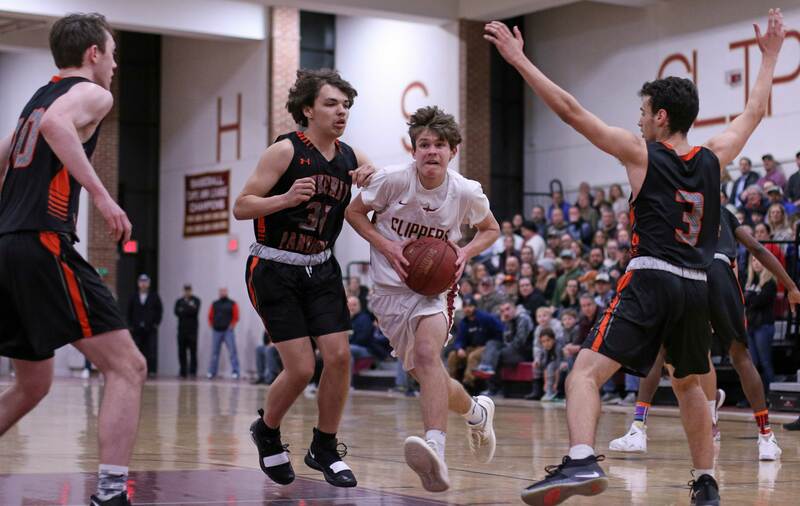 Hard to disagree after seeing his D1 Chieftains dominate Pentucket in the second half and take a 56-43 win on Friday night. 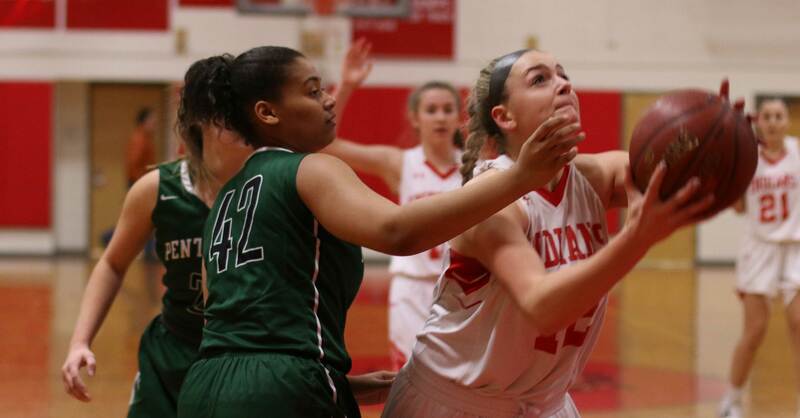 The Sachems (17-3) have the best record in Division 2 North. 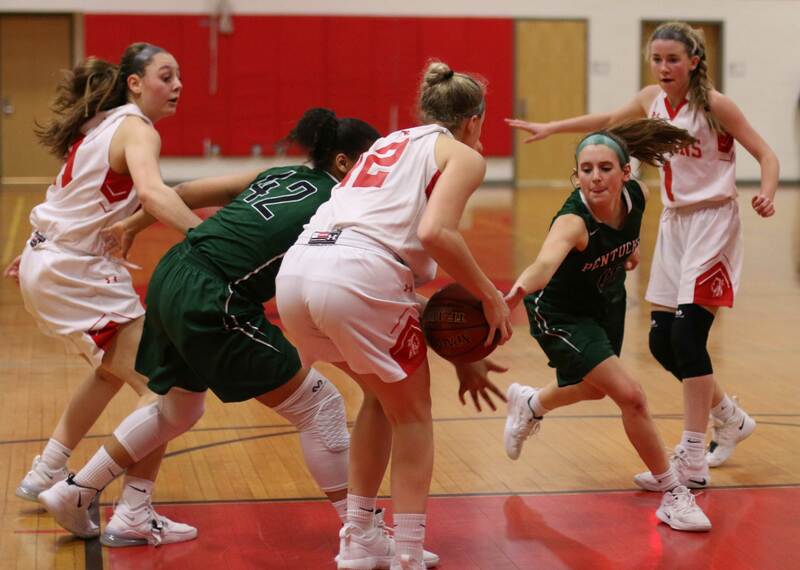 Masco (15-5) lost to Pentucket in January (39-27) but played with much more poise this time around. 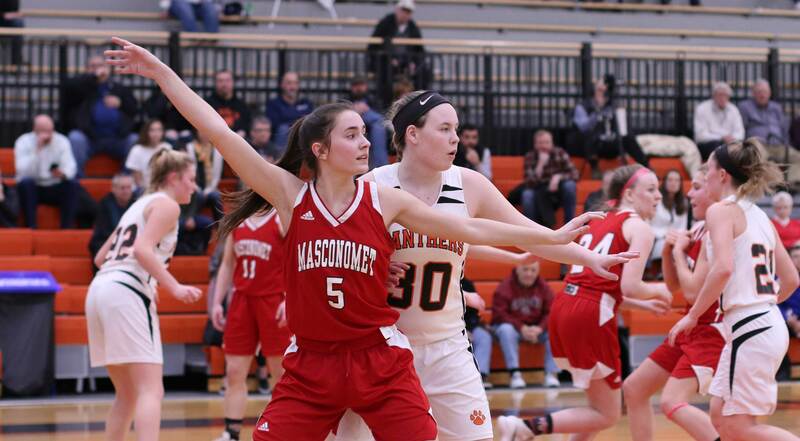 In the first meeting, Masconomet took a 17-11 lead into the second half and then stumbled through a 10-point second half. 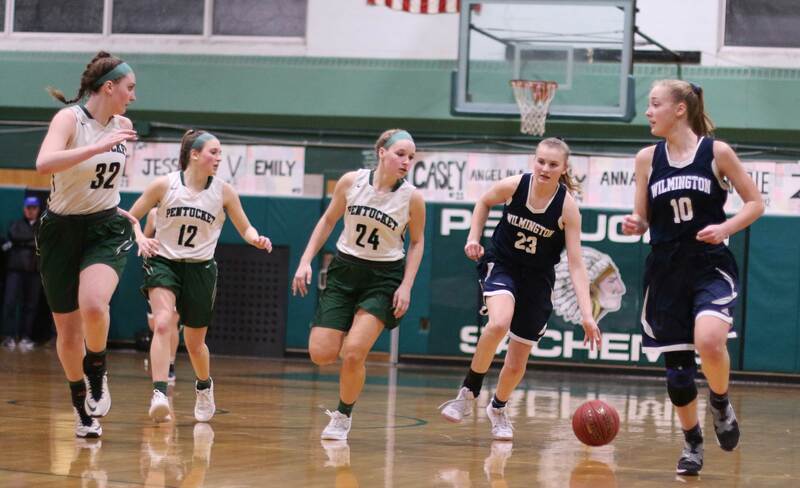 This time around Pentucket had a 21-18 lead at halftime and it was the Chieftains pleasing the home crowd with a 38-point second half. With the scored tied, 26-26, three minutes into the second half, Mak Graves took over. 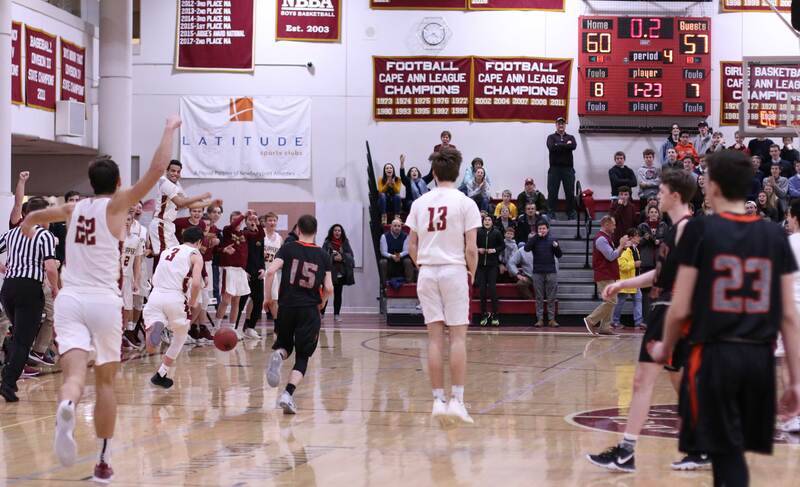 The flashy junior put a jump shot, a three (from Cally McSweeney), and two free throws together. 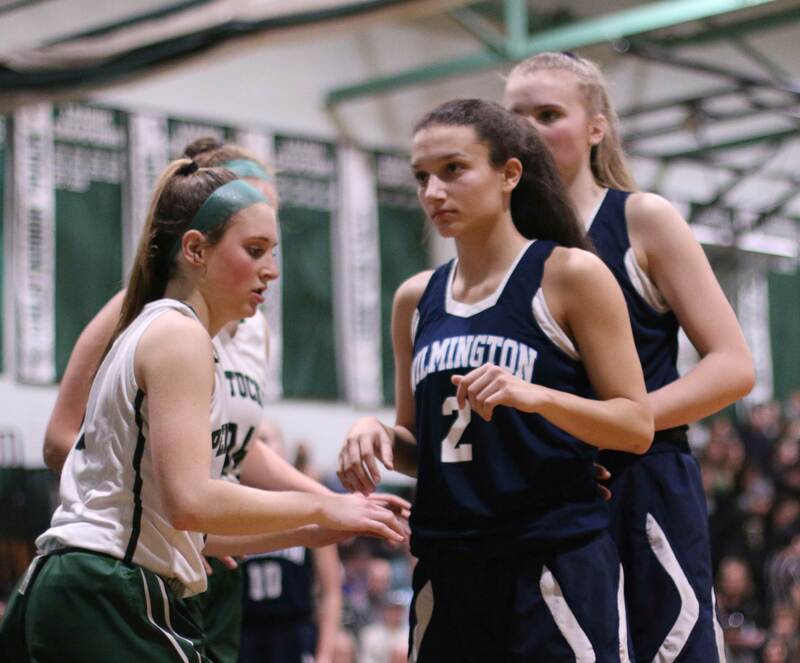 Pentucket had just a free throw (Angelica Hurley) during this three-minute segment. 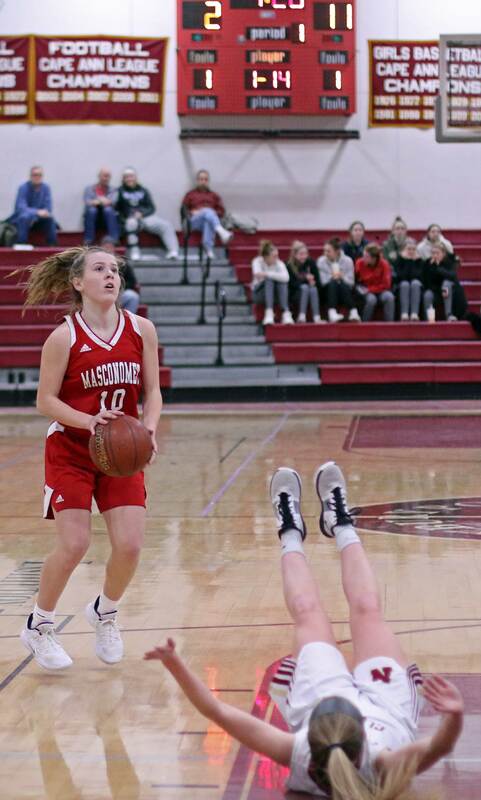 Masco had separation, 33-27. The game was far from over. 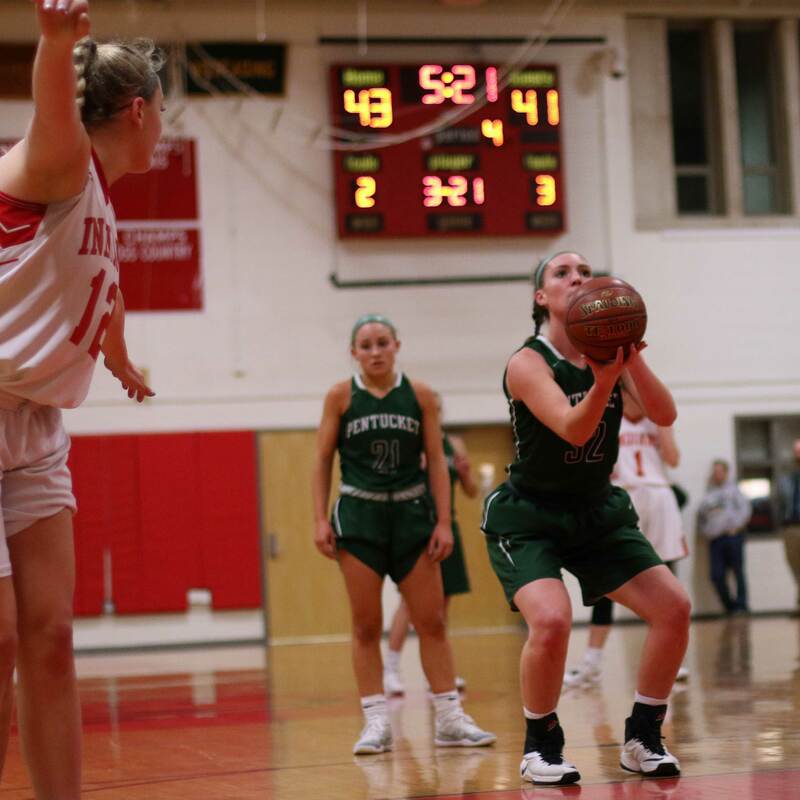 Early in the 4th quarter two free throws and a Jess Galvin three (from Maddie Doyle) had the Sachems down four, 39-35. 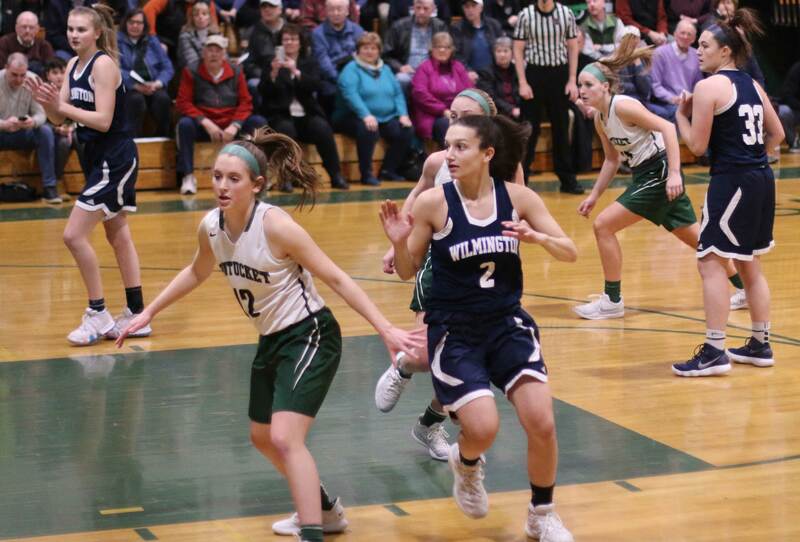 Later, a layup by Angelica Hurley (15 points), a free throw (Anna Wyner), and a three by Angelina Yacubacci (16 points) and Pentucket was within one possession, 44-41, with 3:50 remaining. 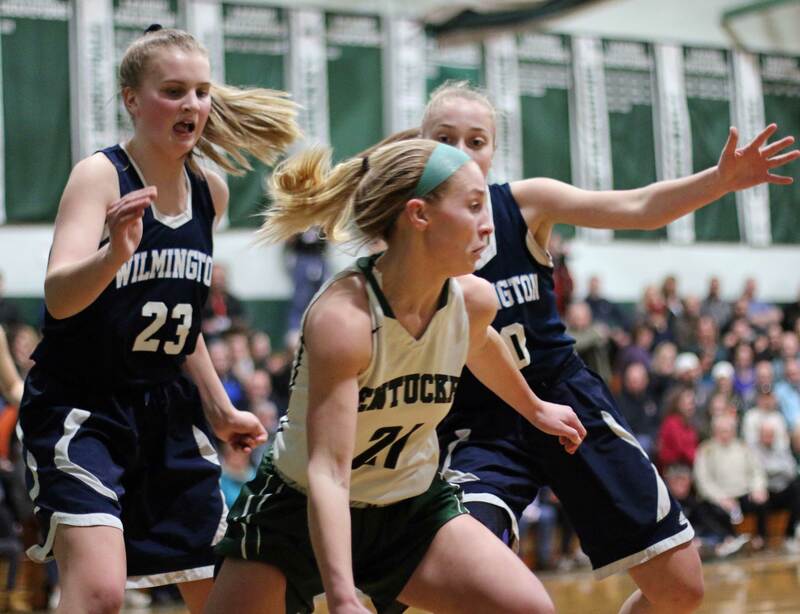 On this evening, Pentucket couldn’t stay close down the stretch. 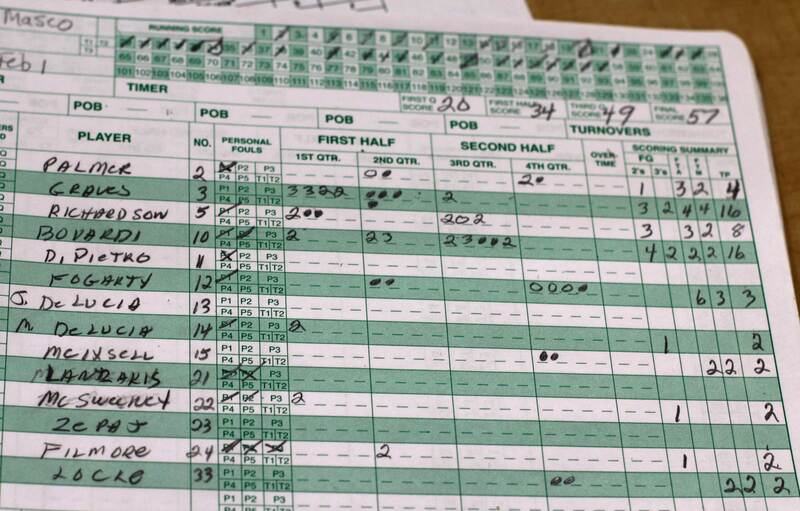 Pressure games, tight games, always seem to come down to free throws in crunch time. 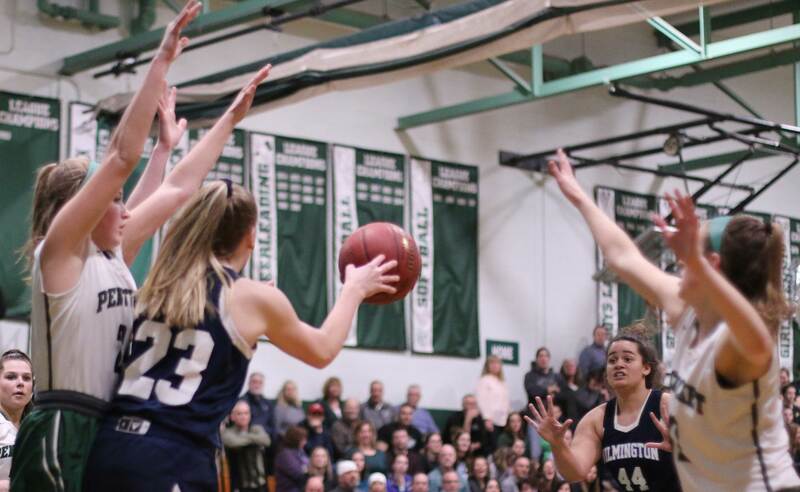 After an Olivia Filmore jump shot on an inbounds play started the final 3:50, the Chieftains paraded to the foul line twelve times. They made ten! “We made our free throws when we had to,” said Coach Romeo. 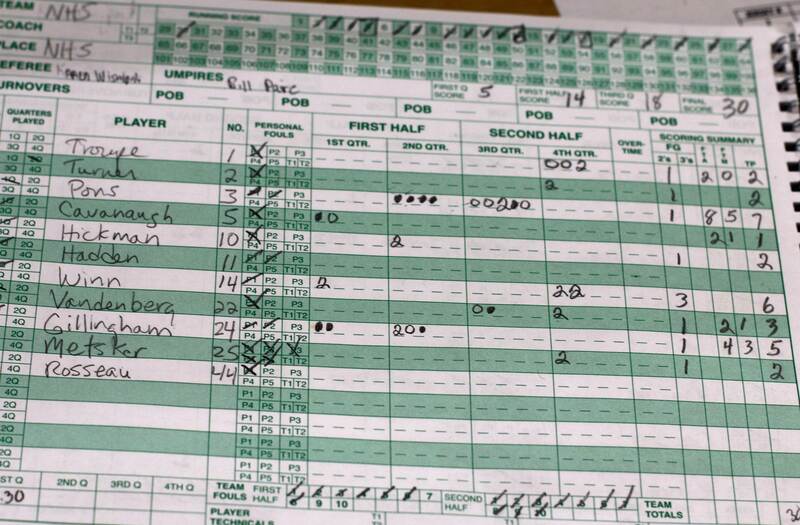 The Sachems had just two made free throws (in four tries) during the final 3:50. 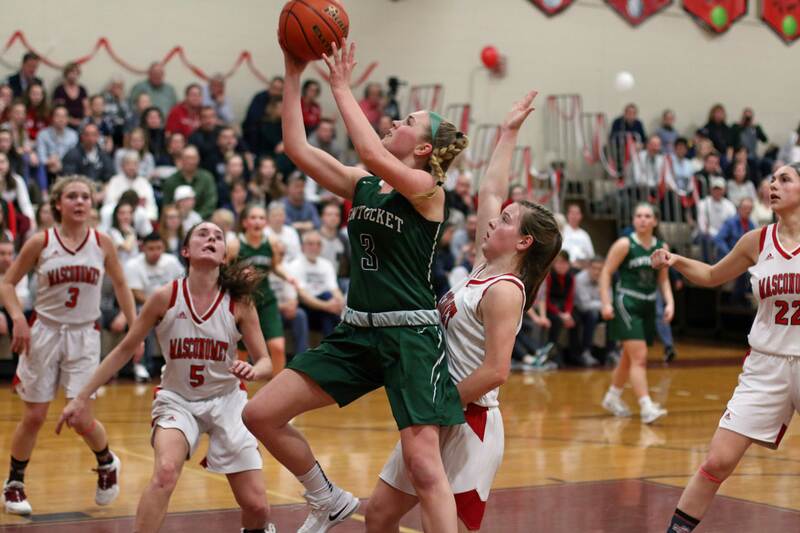 That 14-2 finish for Masco was enough to give Pentucket a rare loss. 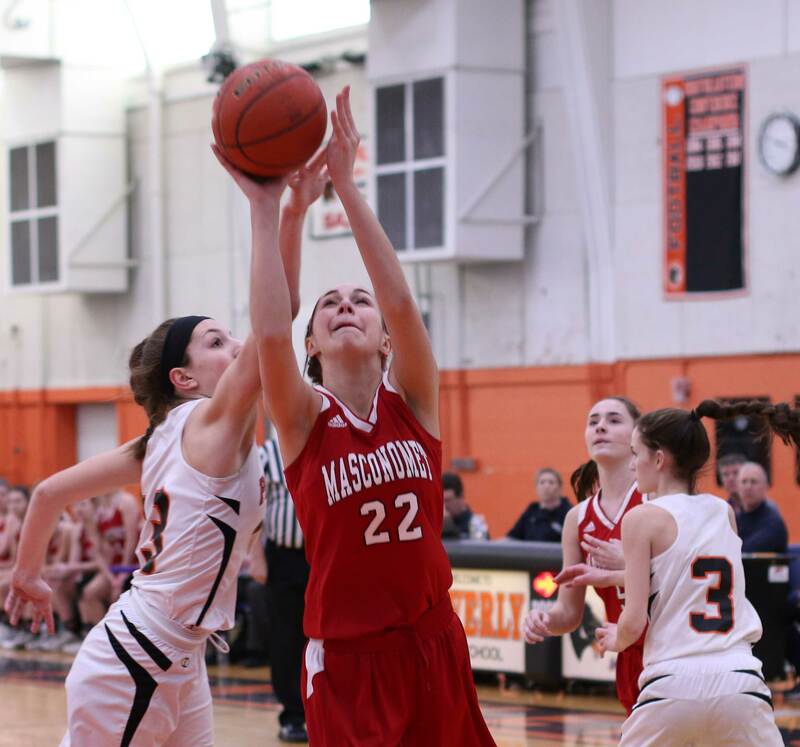 Morgan Bovardi had seventeen points for Masconomet. 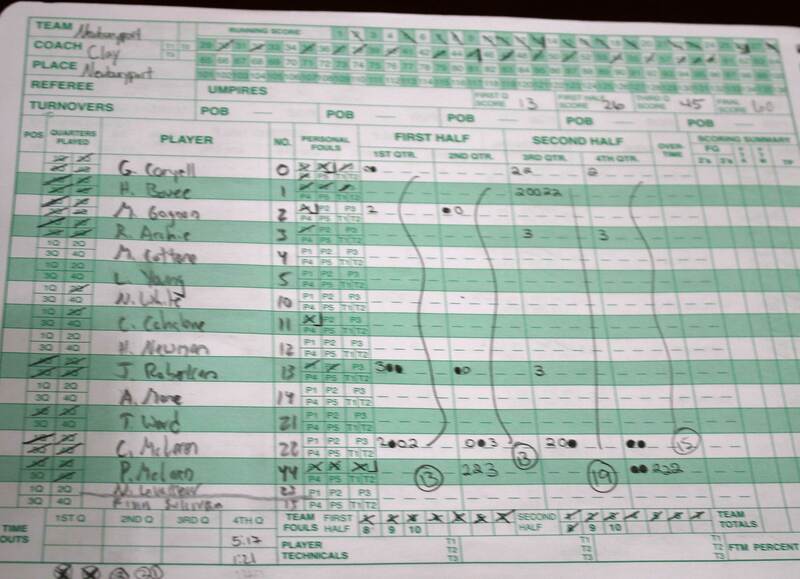 In the first meeting, Morgan was in foul trouble early and had a 3-point night. 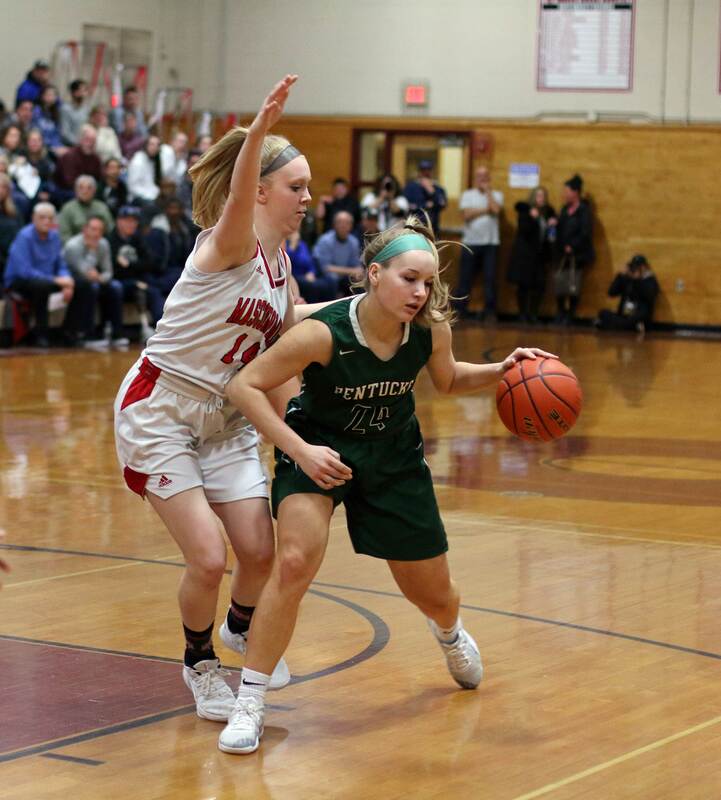 Having both Mak Graves and Morgan on the court most of the night enabled the Chieftains to handle Pentucket’s non-stop pressure. 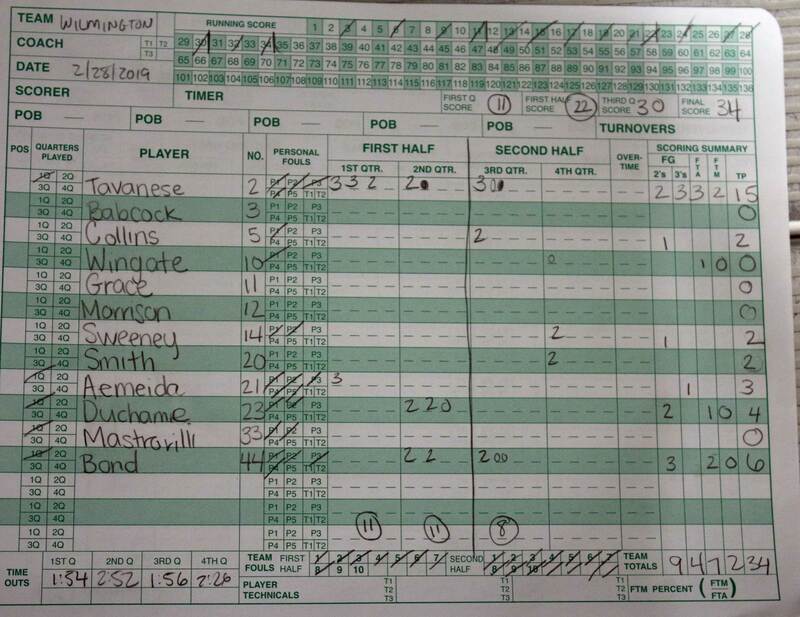 Paige had ten points and ten rebounds. 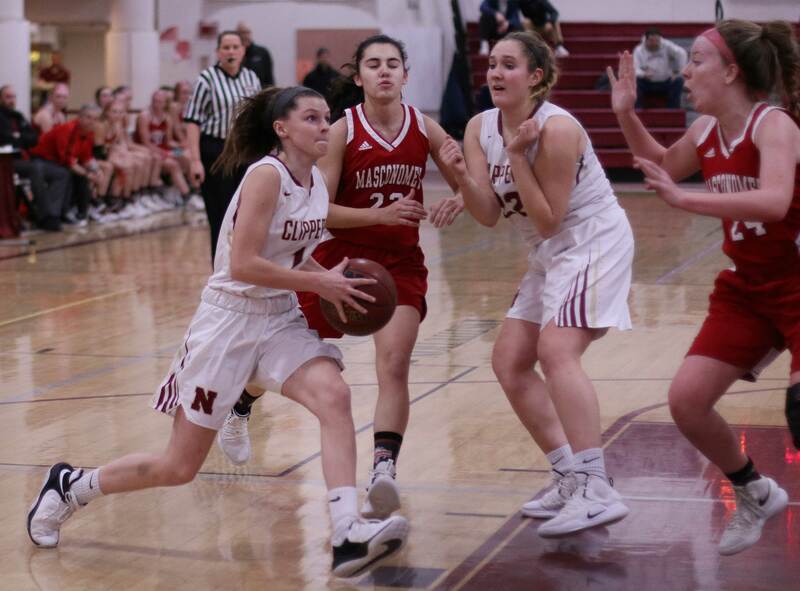 You had to think that it might be Masco’s night when in their first-half struggle to score points they were able to bank in two 3-pointers. 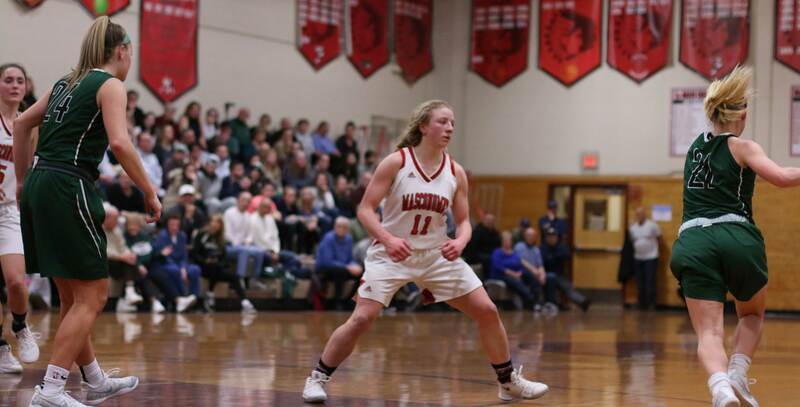 Take those two shots away and Masco is down by nine at the half instead of three. Both teams had surprising losses recently against teams they had defeated soundly in first meetings. 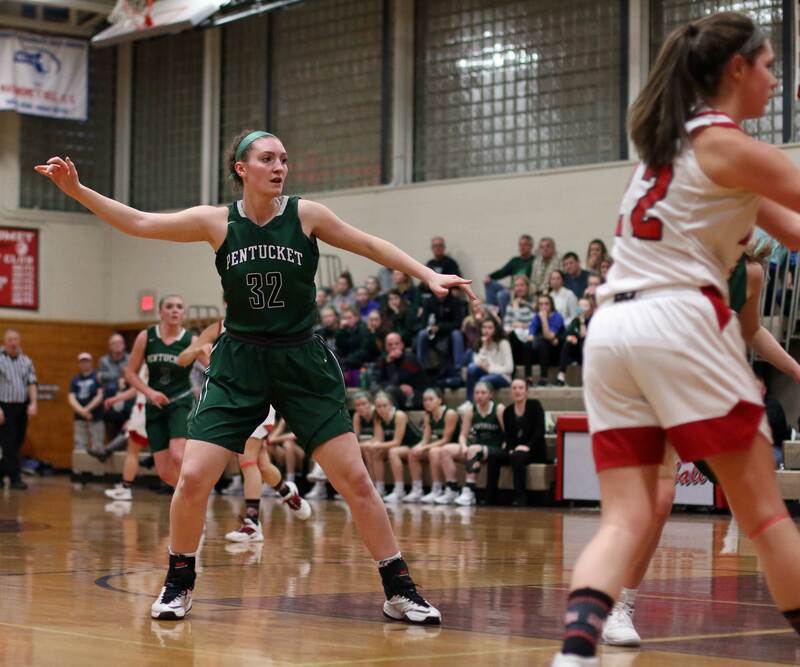 For Pentucket it was Notre Dame (Hingham) and for Masco it was North Reading. But that’s why we show up to games; you never know what will happen. The Chieftains honored their two seniors (Sara Fogarty and Marissa DeLucia) before the game. (Newburyport MA) This had the feel of a tournament game. Close, tense, free throws, last shot, and jumping around in celebration for the winners. 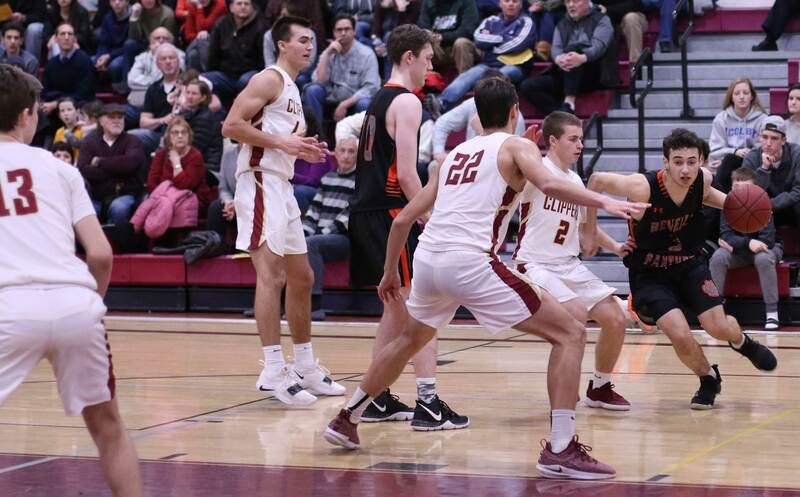 It was the Clippers (16-3) enjoying the happy ending as they defeated a very good Beverly team, 60-57, on Monday night. 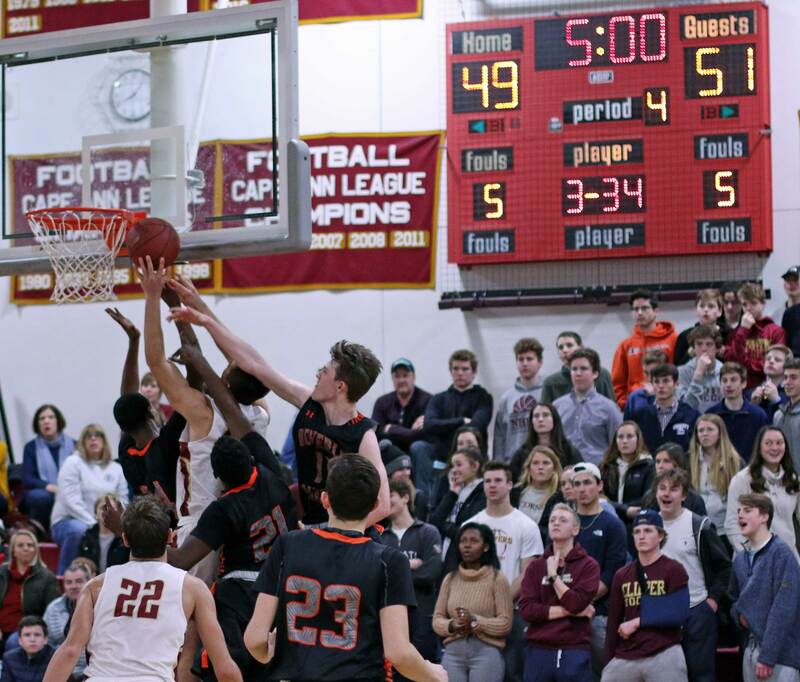 “It was an excellent high school basketball game from start to finish,” said Beverly coach Matt Karakoudas afterwards. 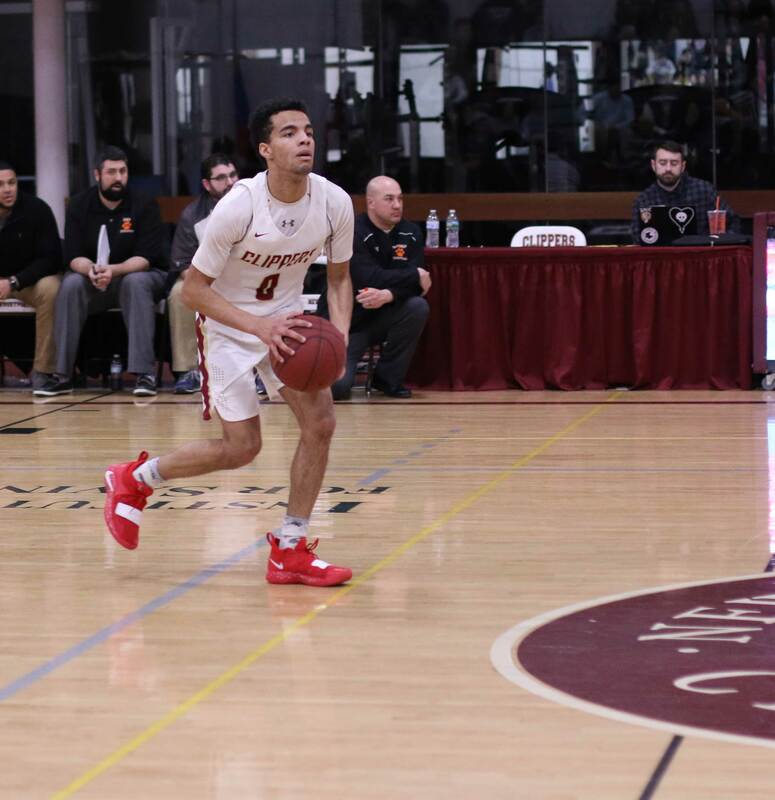 Senior Toskany Abreu (29 points) had a monster game for the Panthers (10-6). 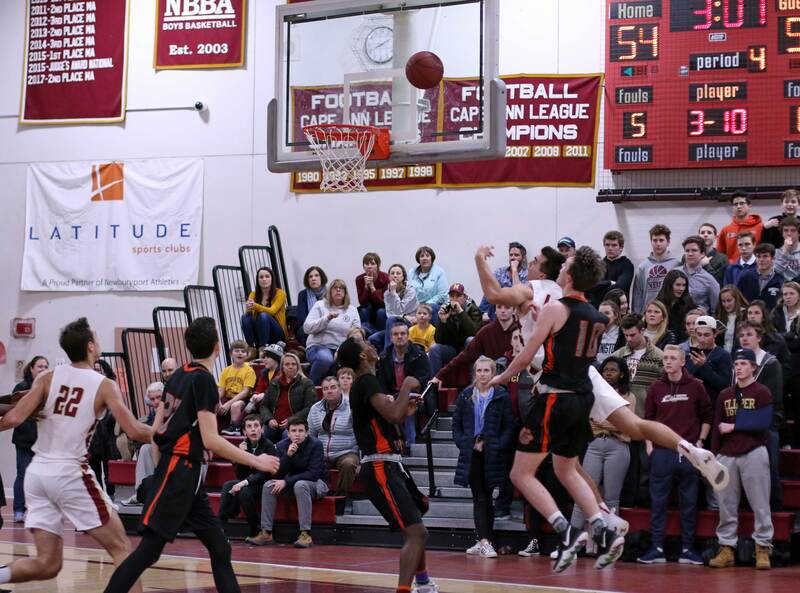 The BHS guard was able to get into the lane most of the time for layups despite an assortment of Newburyport defenders trying to stop him. 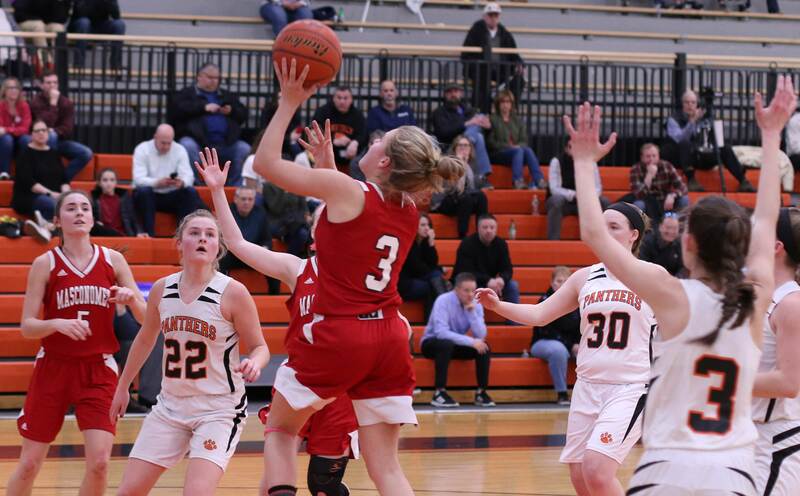 The visitors from the Northeastern Conference took a one-point lead (57-56) into the final 2 ½ minutes after Toskany hit two free throws. 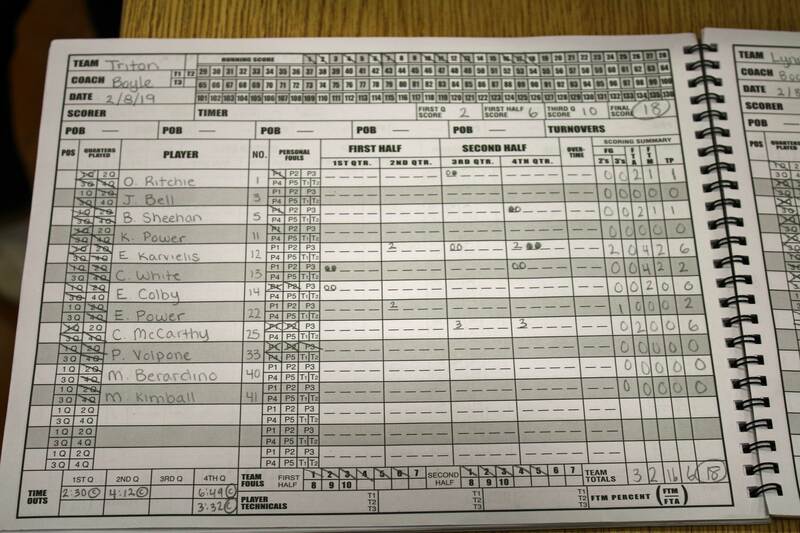 Beverly wouldn’t score another point. 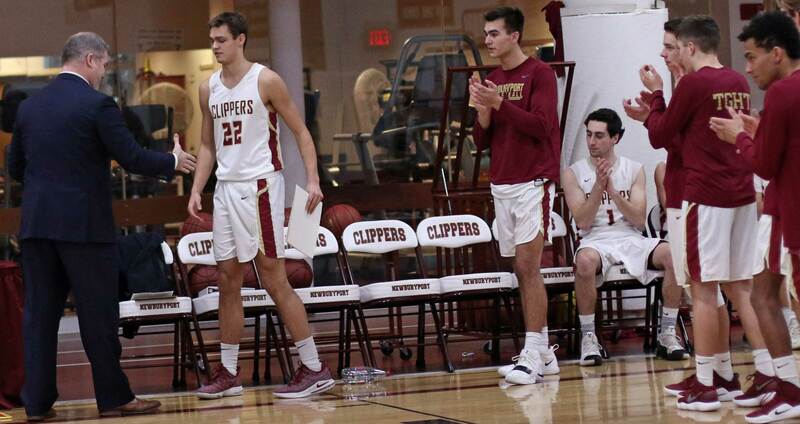 Parker McLaren (15 points) finished an eight-point quarter with a jump shot in the lane assisted by Ryan Archie to put the Clippers in front 58-57 with 1:54 remaining. 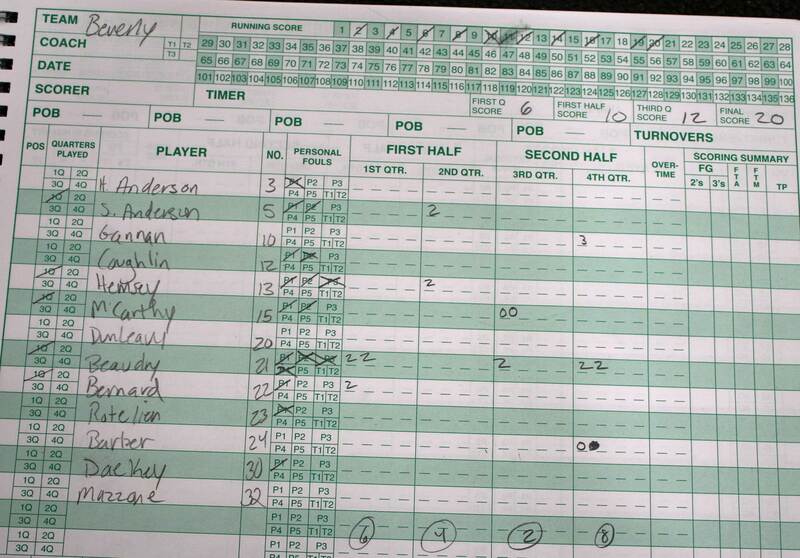 Both teams then traded turnovers and Beverly had the ball back with thirty seconds left. After the way things had gone all night, it wasn’t hard to imagine Toskany getting the shot in the crucial possession. But that’s not what happened. Harry Bovee defended Toskany well enough so that he gave the ball up. Teammate Micah Davies tried a pass to Marje Mulumba under the basket that was high and wide. 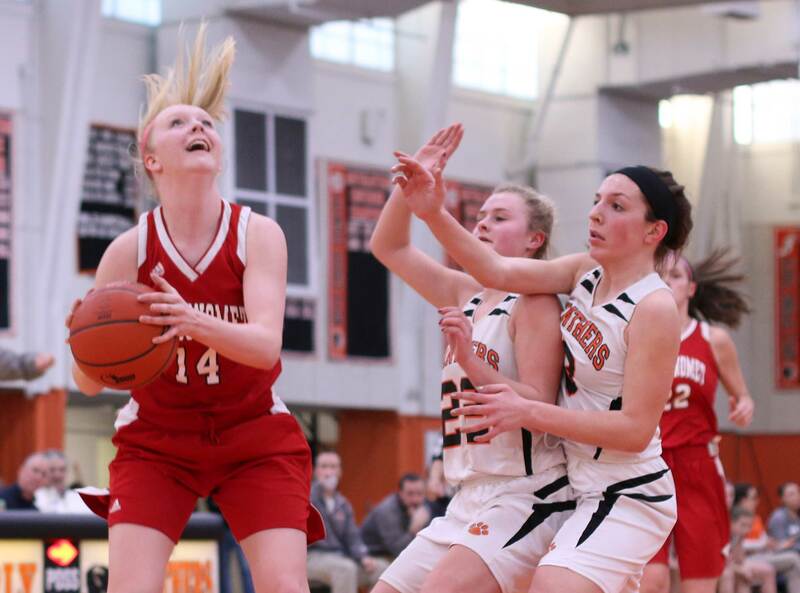 Beverly quickly fouled Casey McLaren and the pre-game honoree rattled two free throws in to increase the NHS lead to 60-57 with twenty-three seconds left. Still plenty of time for Beverly to tie it. Again, I imagined Toskany doing something but the Clippers defense forced the ball out of his hands. Instead, senior Micah Davies attempted to tie the game with a three over Parker McLaren. 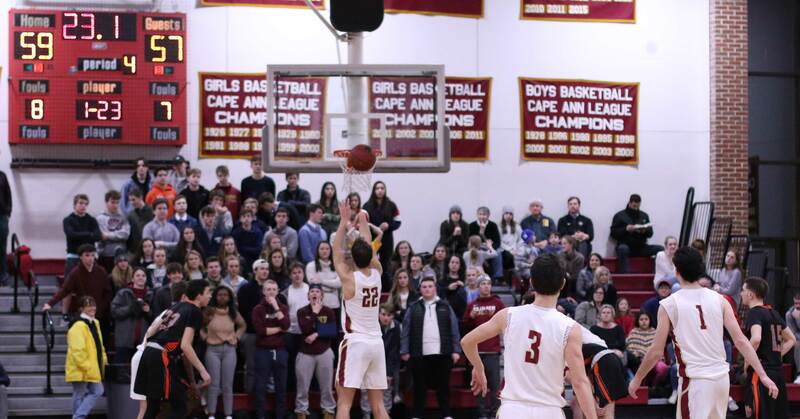 It rimmed out, Newburyport secured the rebound, and the celebrating soon followed. 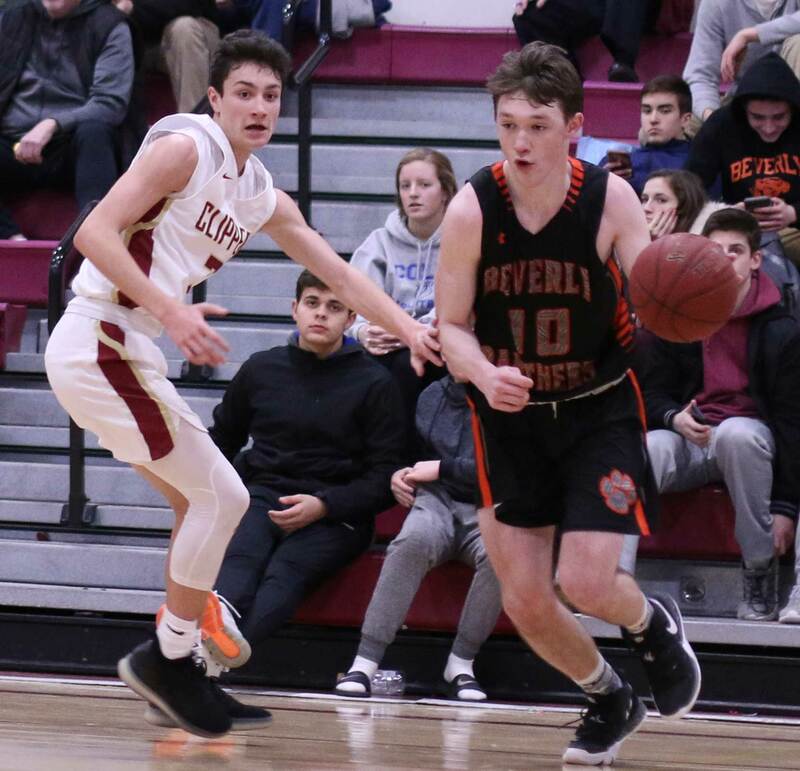 Beverly build up a 10-point lead in the second quarter (27-17) putting a 13-2 run together. Contributors were; Micah Davies, Marje Mulumba, Toskany Abreu, Jack Crowley, and Kyle Camara. The Clippers used the final 2 ½ minutes of that second quarter to erase most of their deficit. 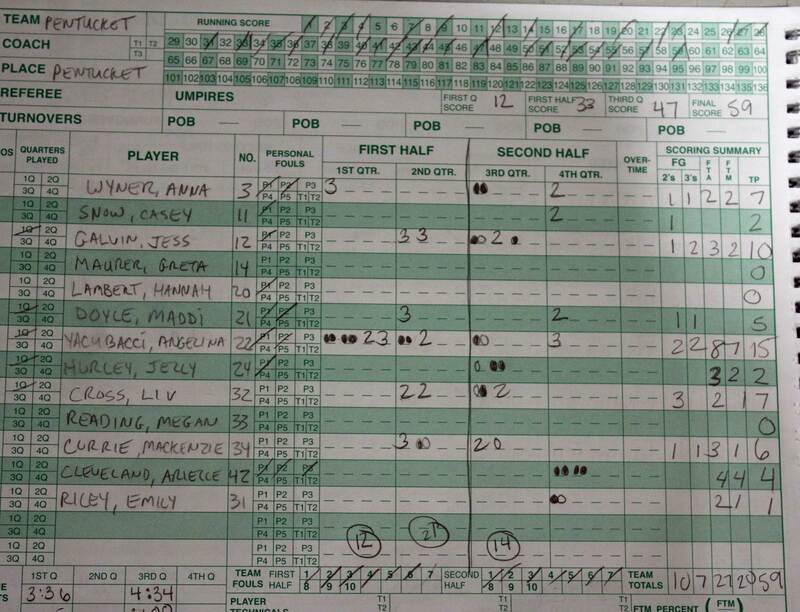 Casey McLaren’s long-range, buzzer-beater had NHS within three (29-26) going into the second half. Casey ended up with fourteen points. The Clippers controlled the first period while the Panthers controlled the second period. The second half was small leads, ties, and back-and-forth. Nice crowd on hand including a collection of Pentucket players. 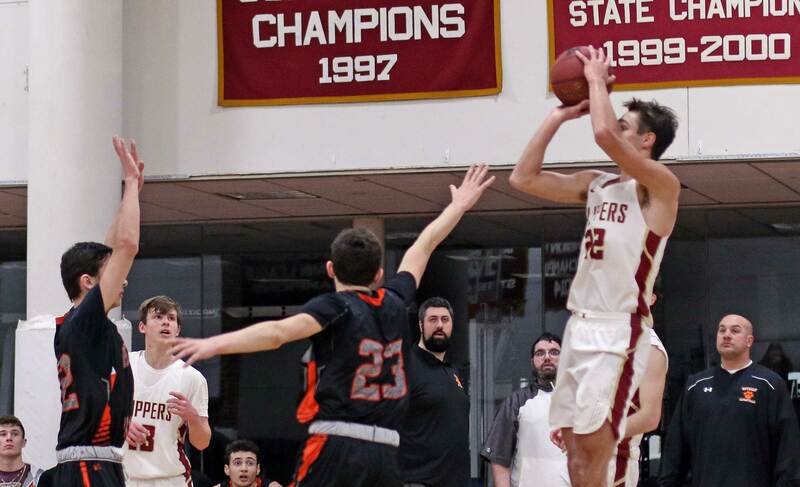 The Sachems won a big one from Newburyport on Friday night. Casey McLaren was honored pre-game by state representative James Kelcourse for reaching 1000 points. 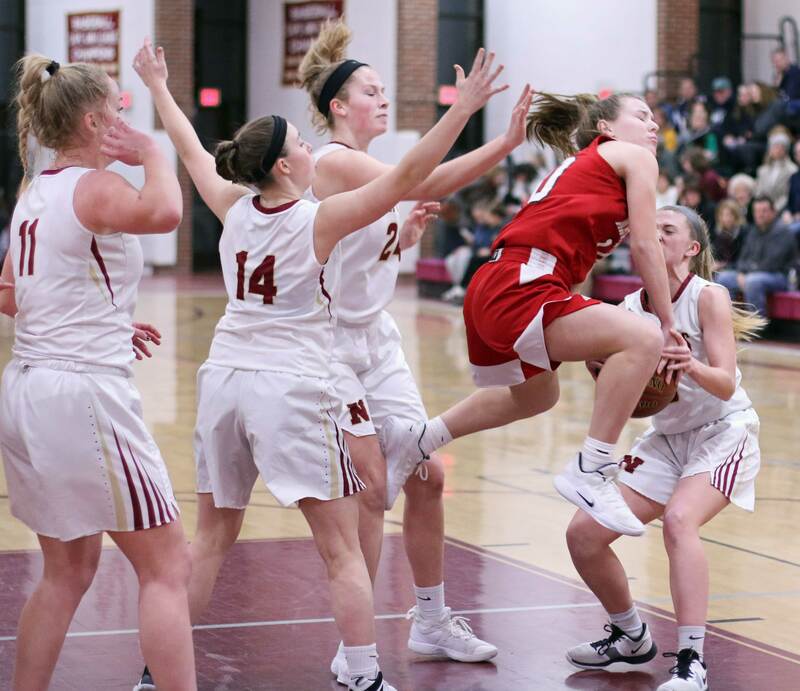 That’s what Masco coach Bob Romeo wanted, and he certainly got it as the Chieftains routed Newburyport, 57-30, on a chilly Friday night of Cape Ann League girls basketball. The Clippers (8-7) scored the first basket (Meg Winn) but it was all downhill for them from there. 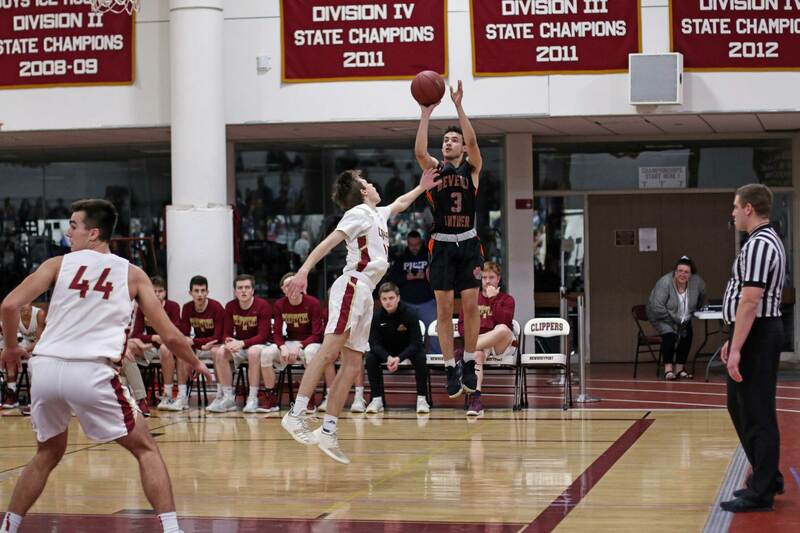 Masco (12-4) had unanswered point streaks of eleven, eight, and sixteen before Coach Romeo permanently benched his starters with three minutes left in the third quarter. 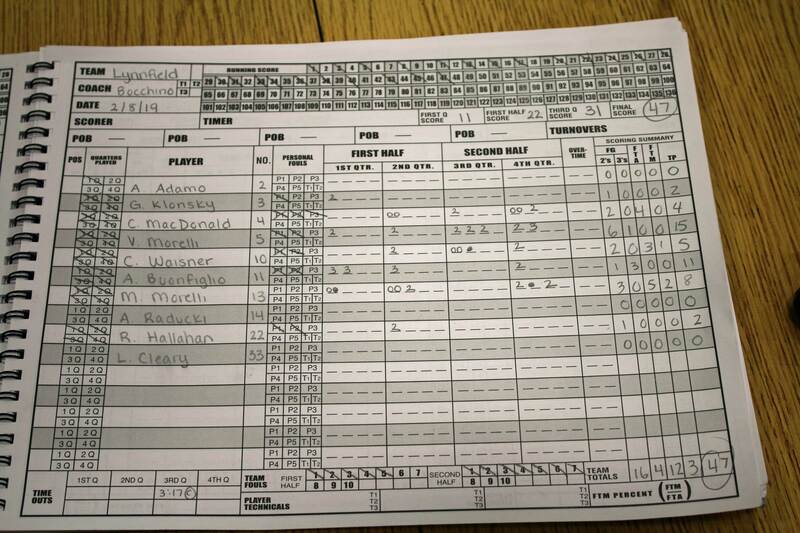 The Chieftains had a 49-14 lead at the time. 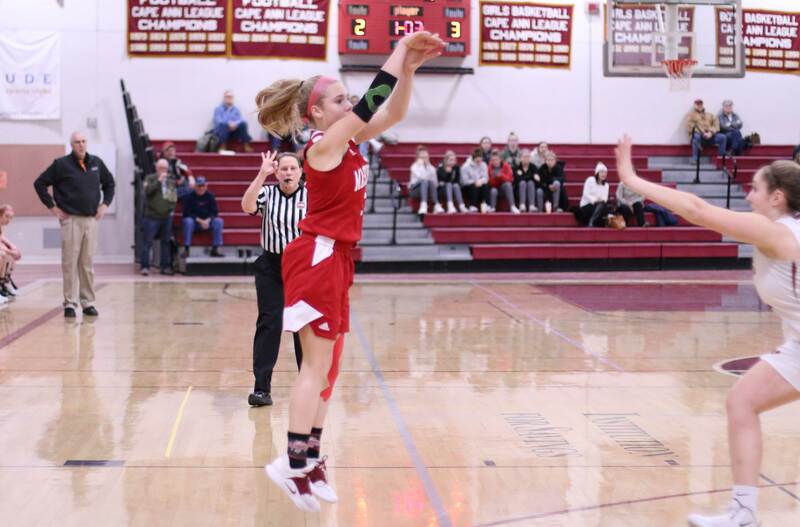 The first Masco run of points (eleven) answered NHS’s two-point start. 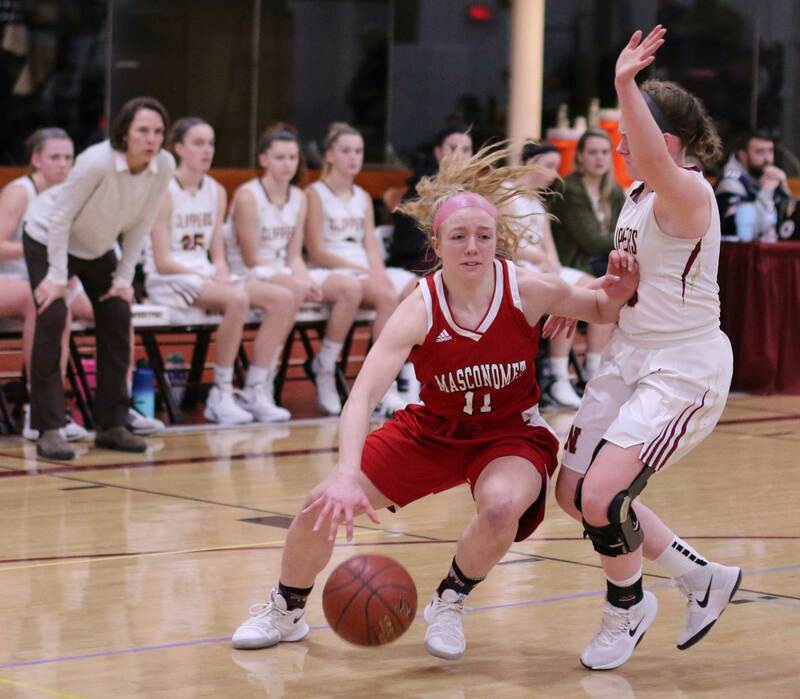 A three by Mak Graves (16 points), a drive by Morgan Bovardi (16 points) and three baskets set up by Morgan sent Masco ahead, 11-2. The second run of points (eight) happened soon after the first one. 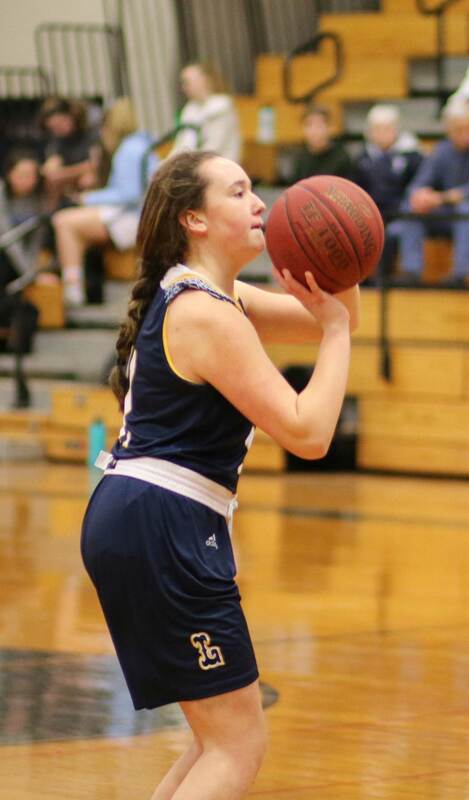 Free throws by Paige Richardson started it and that was followed by two Mak Graves drives and a Morgan Bovardi drive. This collection of points put Masco on top, 22-5, early in the second period. 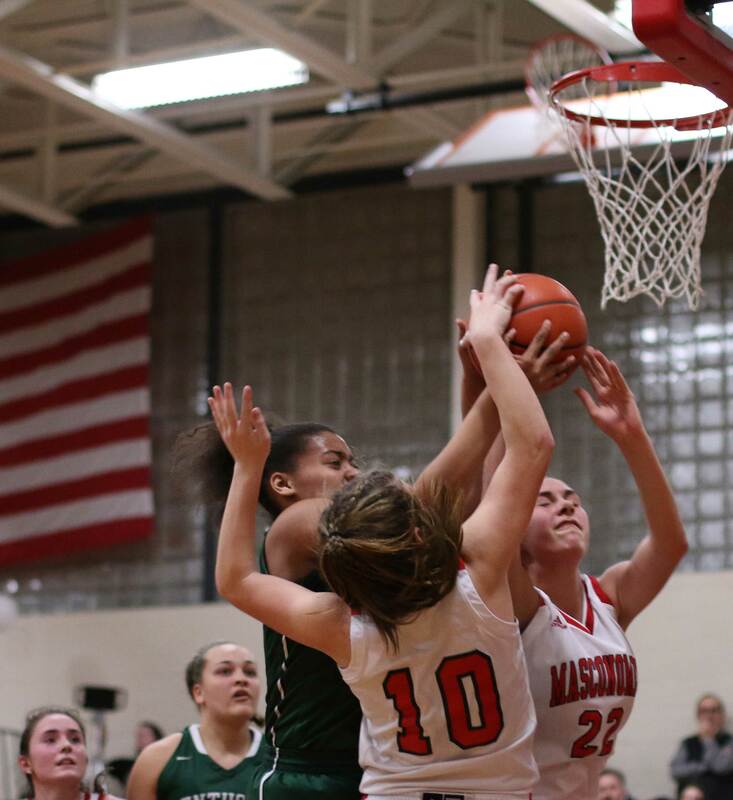 Masco was able to get to the basket with ease. Lacking for the Clippers was any sort of help defense. 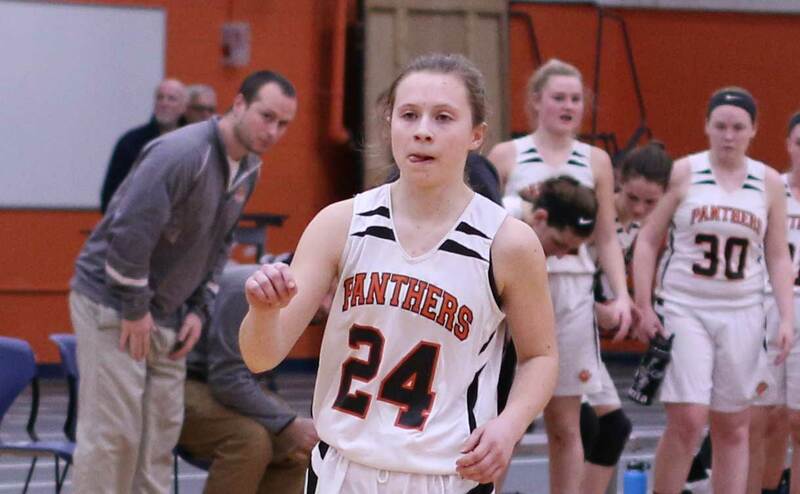 Mak Graves hit from long distance and got to the hoop for twelve first-period points. 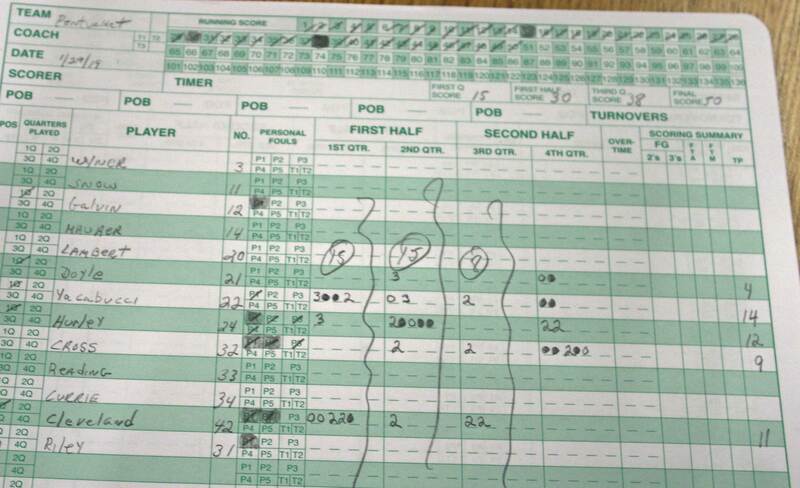 Mak had only two points in the first meeting. On this evening it was quickly obvious that the Clippers would have their hands full trying to defend the Clippers. Sometimes a team can score enough points to make up for it. Didn’t happen tonight! 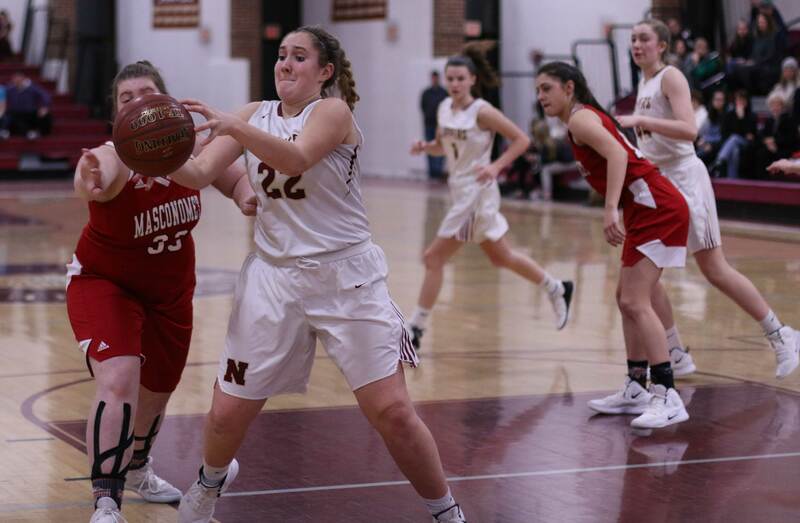 The Newburyport offense had an even tougher night than the defense did. Anyone connected to NHS basketball may want to skip the next paragraph. Consider yourself warned! 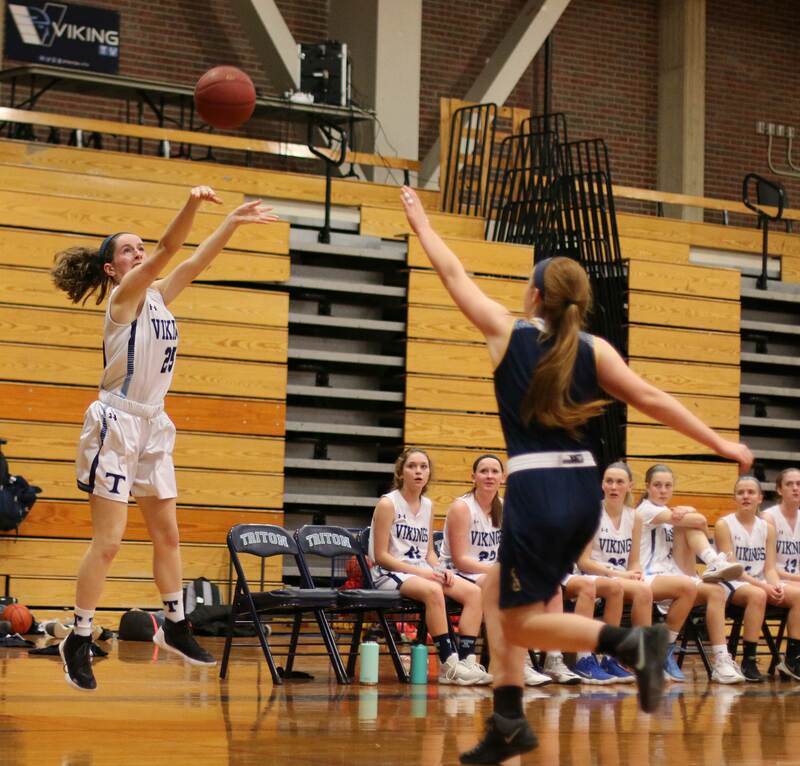 Two free throws late in the second period by Maggie Pons put the score at, 33-14, with 1:50 left. The Clippers didn’t score for the next eight minutes of playing time (a full quarter of playing time). 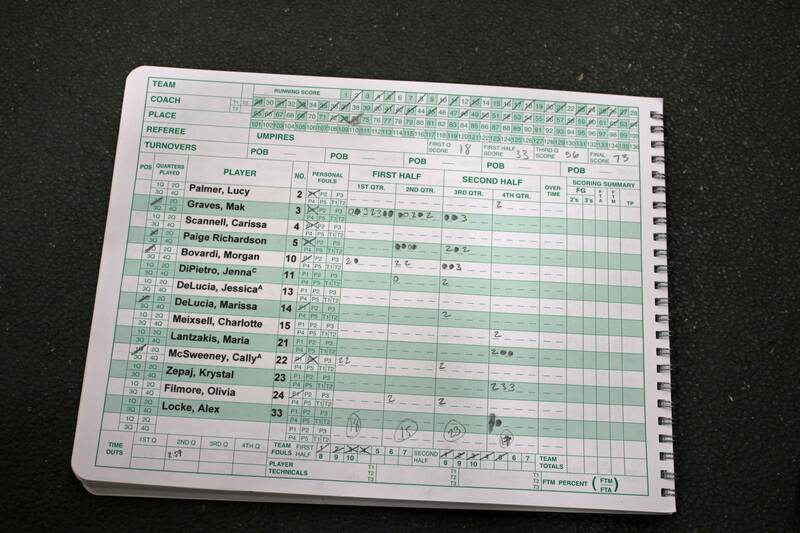 The visitors tallied sixteen points in a row. 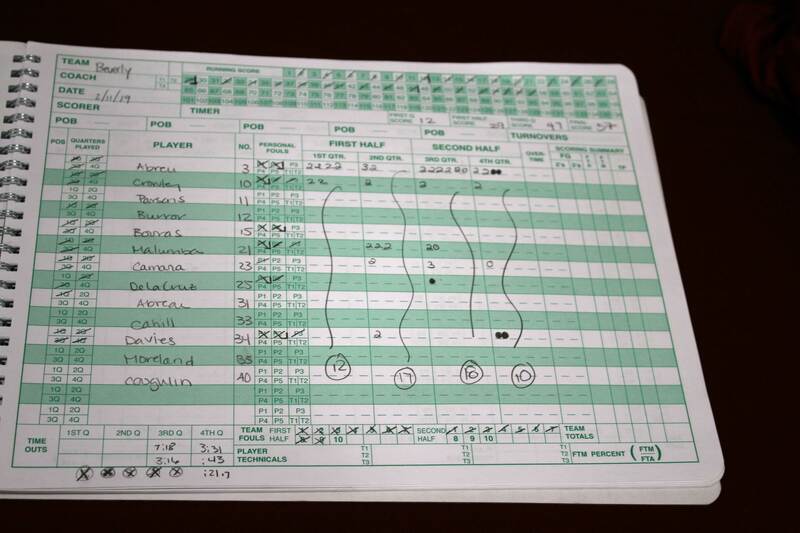 Morgan Bovardi had eleven of the points. The worst part of it all for Newburyport? They had thirteen turnovers during this trying time for them. From where I was watching, most of the turnovers were bad passes in their half-court offense. 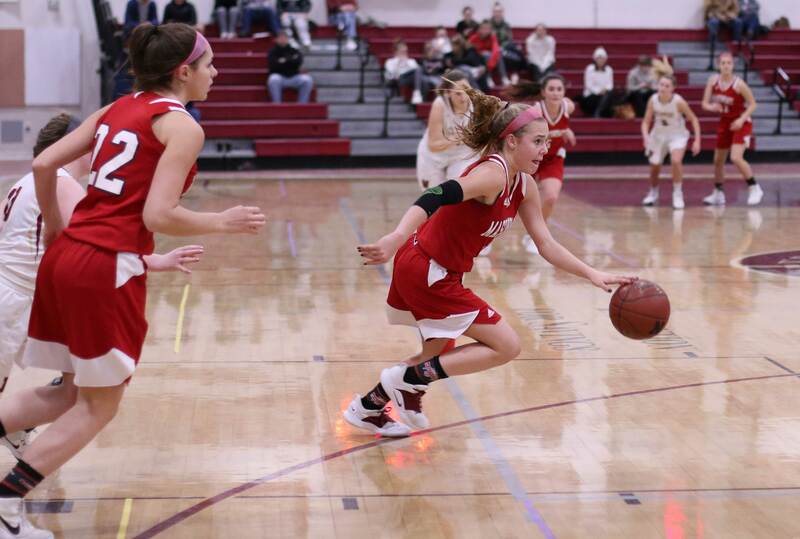 The Masco defenders jumped passing lanes with great success. 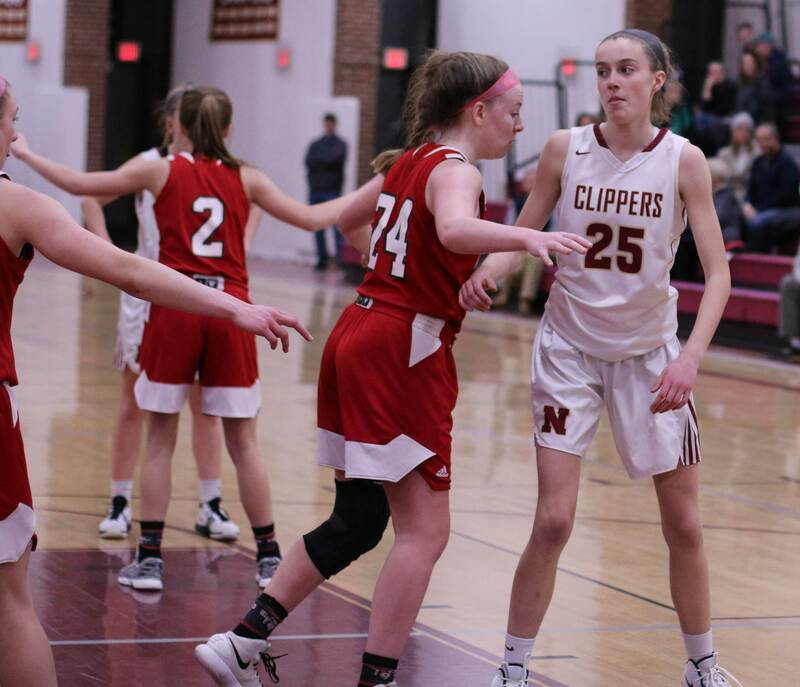 The deadly combo of less-than-the-best offense/defense left Newburyport down, 49-14, with plenty of playing time remaining. The Clippers totaled twenty-nine turnovers for the night. 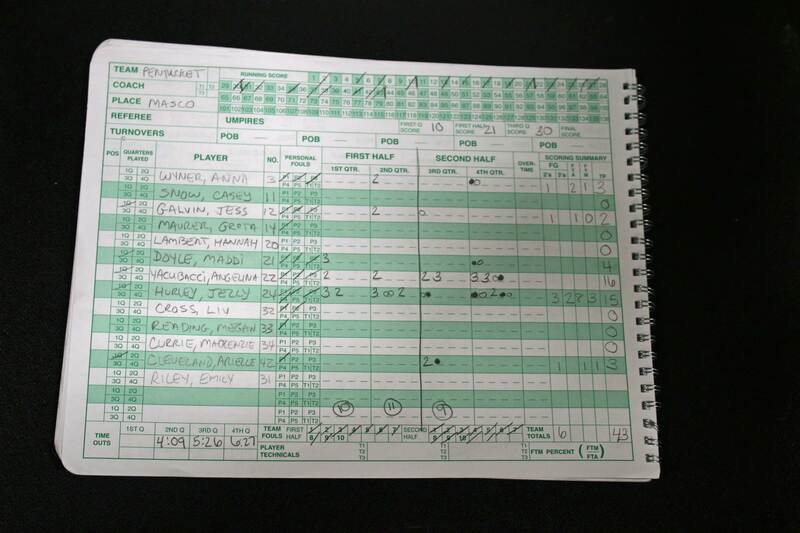 Masco had eight. 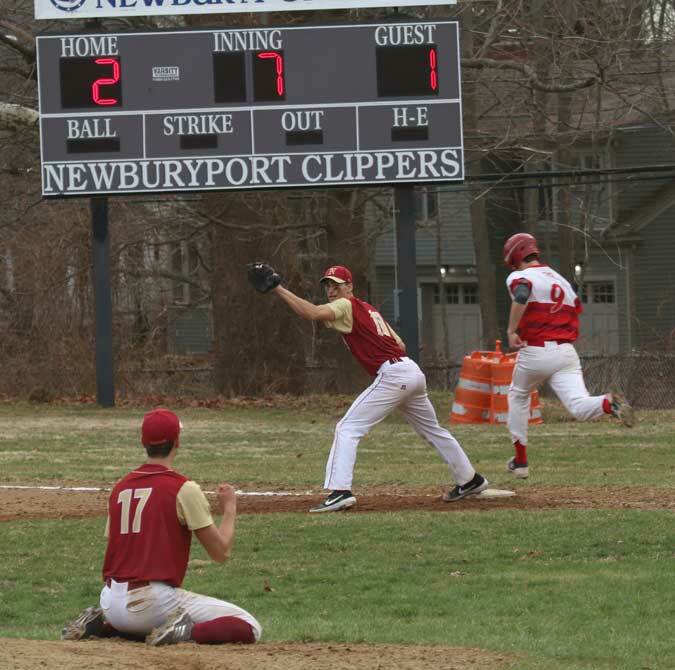 Newburyport has two more tough games in the next six days; Amesbury and Pentucket. 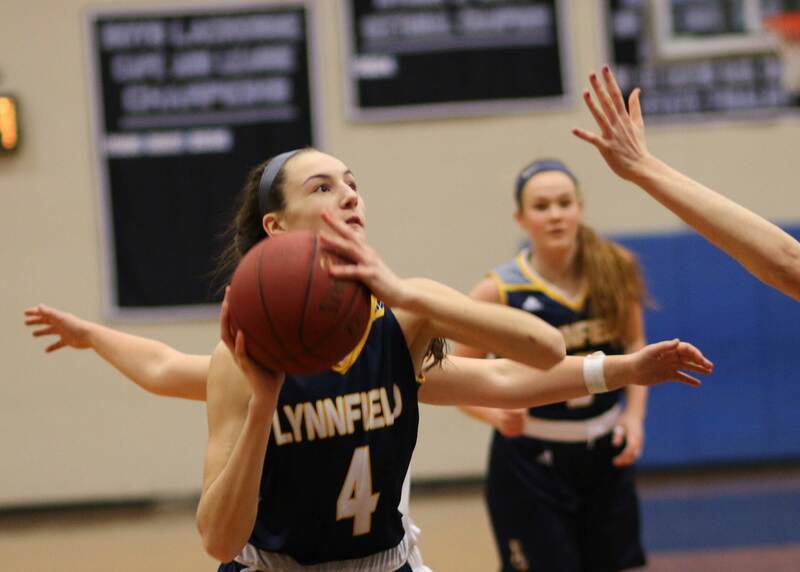 The games are at Newburyport. 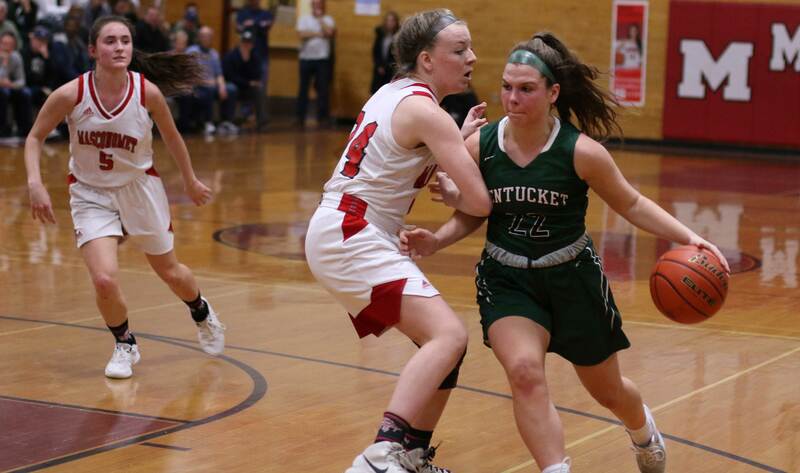 Pentucket had a two-point win over Amesbury on Tuesday. 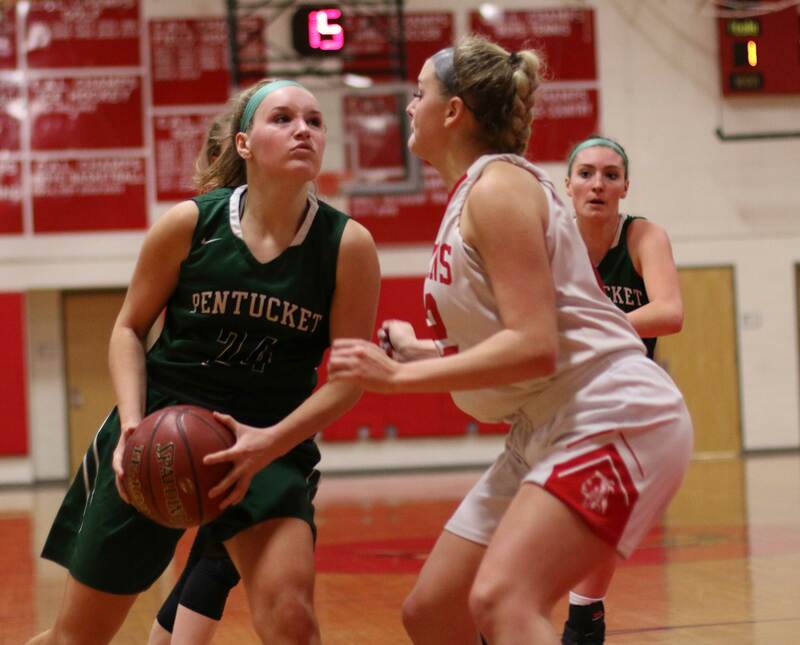 Pentucket has a win over Masco. 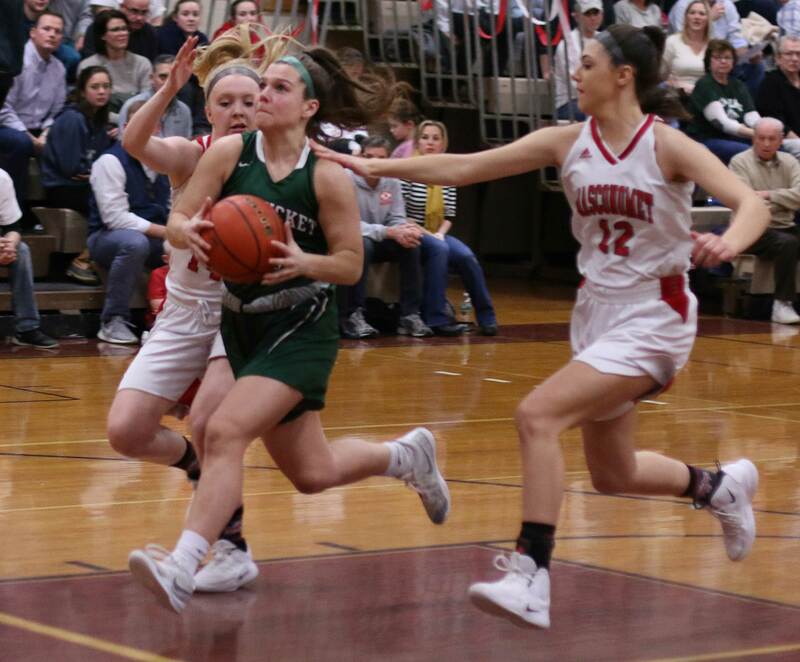 Pentucket & Masco have a rematch this month at Masco. Pretty impressive rendition of the National Anthem by a Newburyport freshman. (Amesbury MA) Amesbury was ahead 20-7 after 5 ½ minutes. 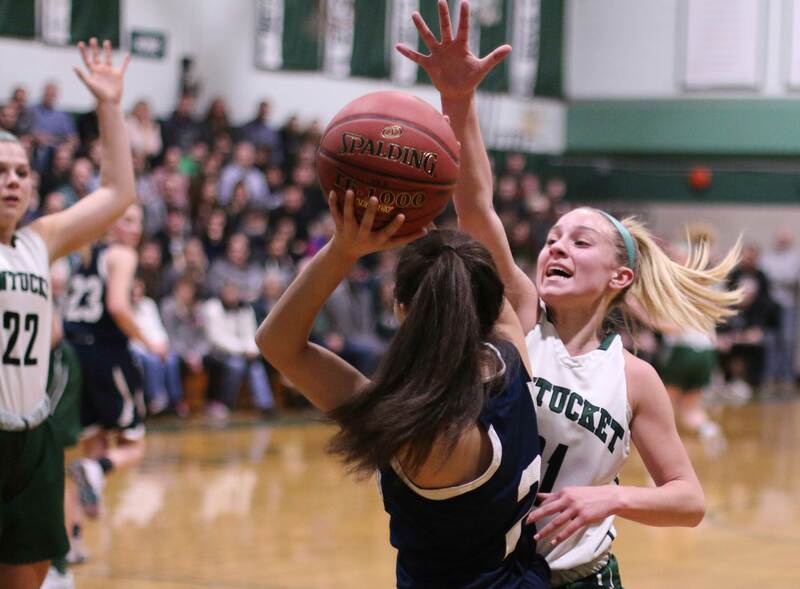 Pentucket was ahead 26-24 seven minutes later. “It was back-and-forth a lot,” said Angelica Hurley afterwards. That back-and-forth thing took time to materialize in the early going but in the final 2+ quarters it happened often. Seven ties. Eight lead changes. 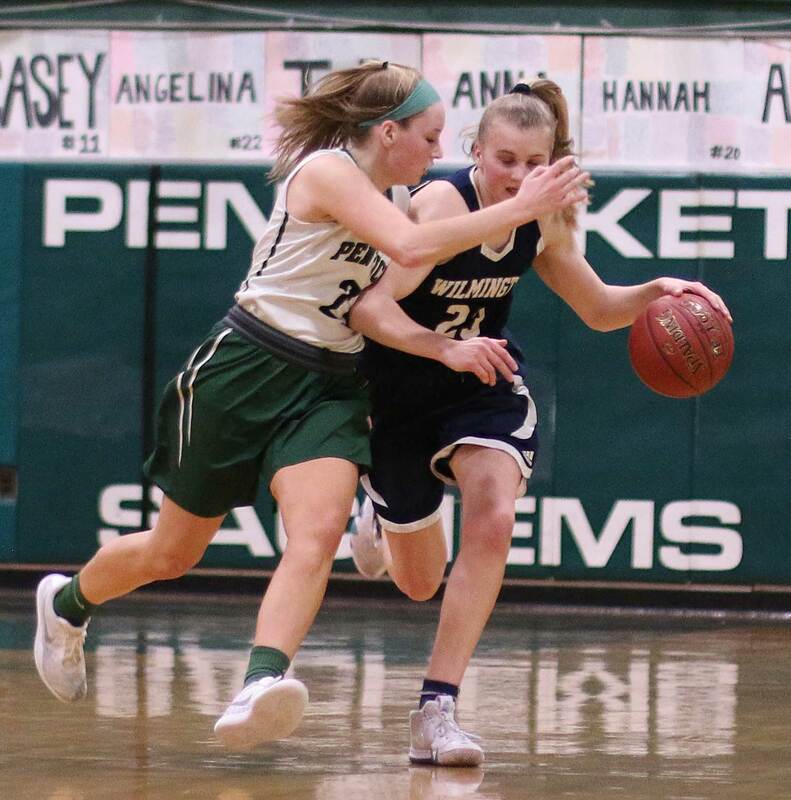 In the end, it was Pentucket (14-1) making the big shots, at the line and from the floor, and turning defense into offense, that carried them to a tough 50-48 win on Tuesday night over Amesbury (12-2). 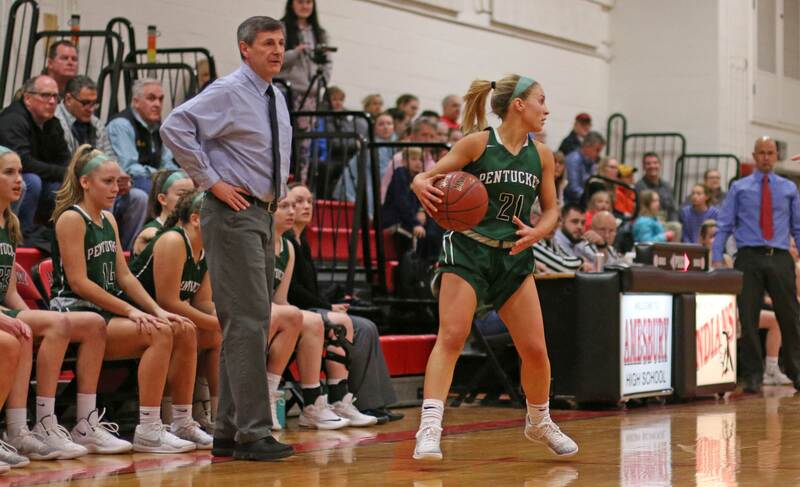 Pentucket has the best record in Massachusetts in Division 2. 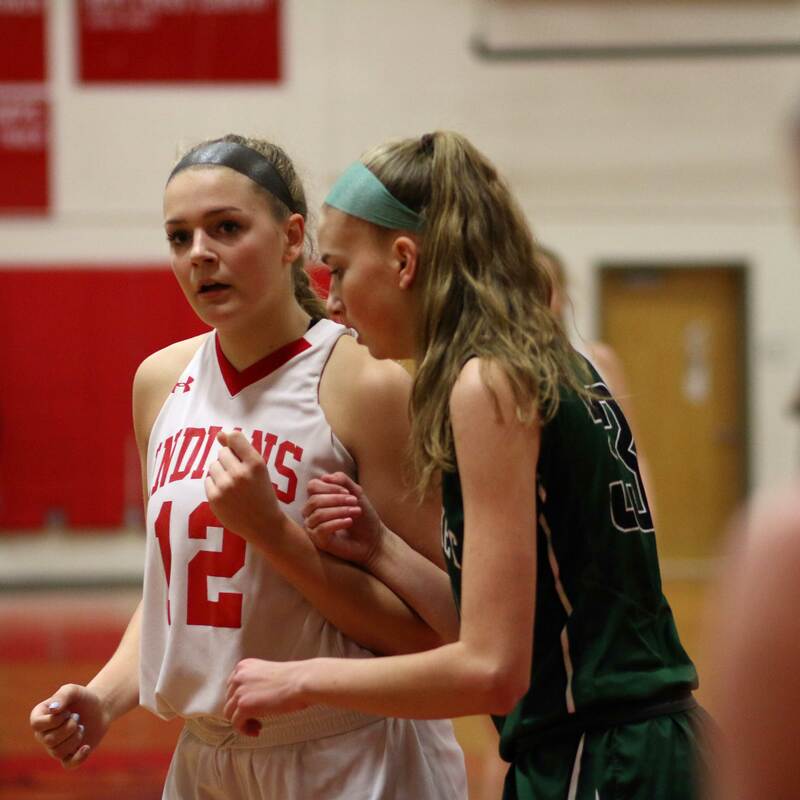 The Sachems took the lead for good (47-45) on a Liv Cross layin with 2:25 left. 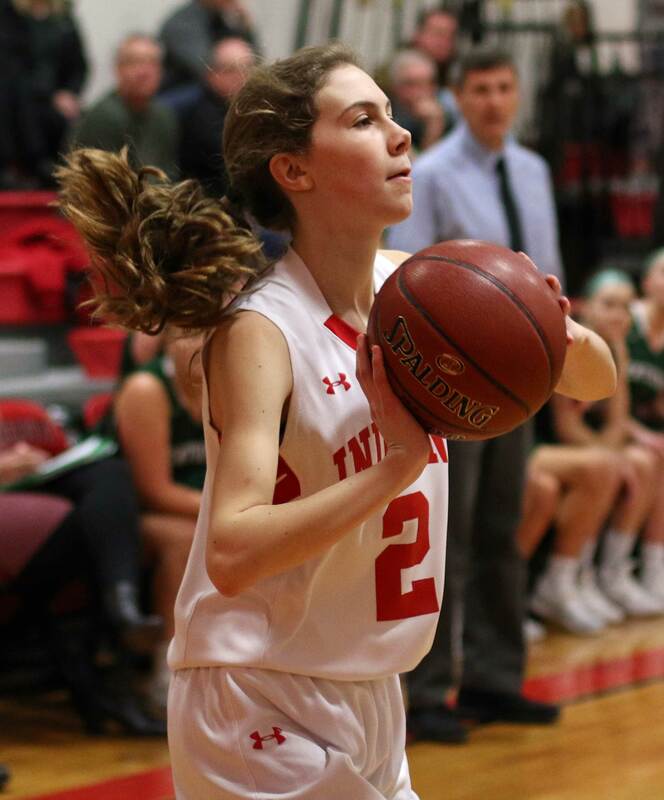 Angelina Yacubacci (16 points) had a steal and made two resulting free throws a minute later to stretch the Sachems advantage to 50-46. 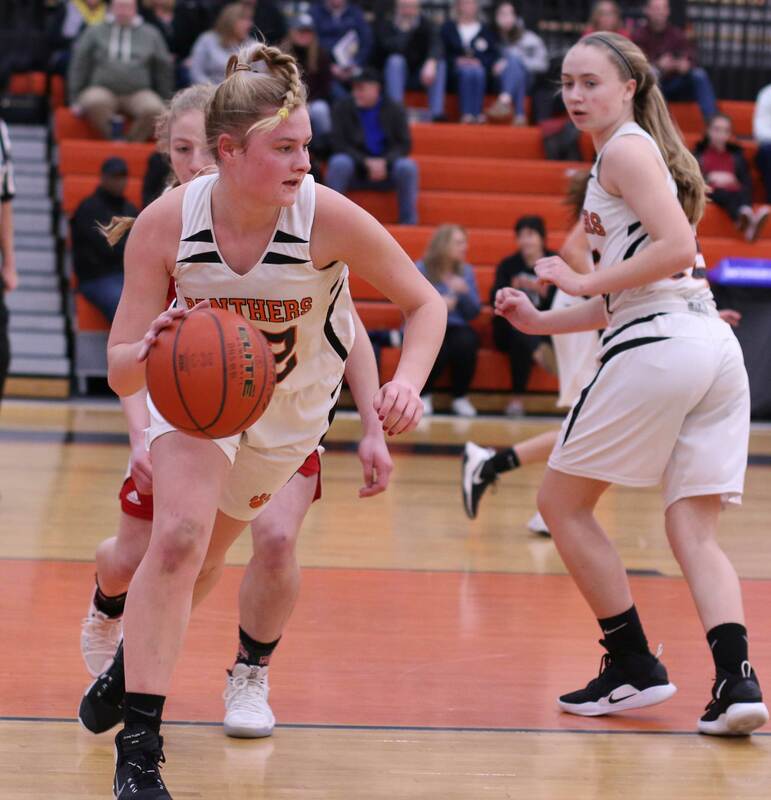 Freshman McKenna Hallinan (7 points) answered with a layup to close the gap to two with 1:04 left, but the Indians (12-2) couldn’t complete the comeback in their two possessions thereafter. The Indians got off to a tremendous start. Shots were falling and uncontested layups were showing up. 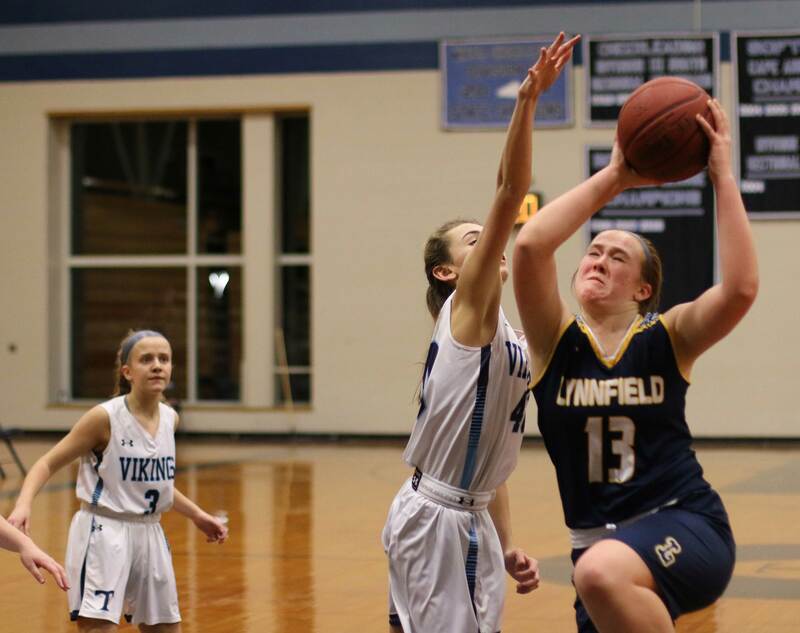 Senior Flannery O’Connor (16 points) dominated the 20-7 getaway with twelve points. 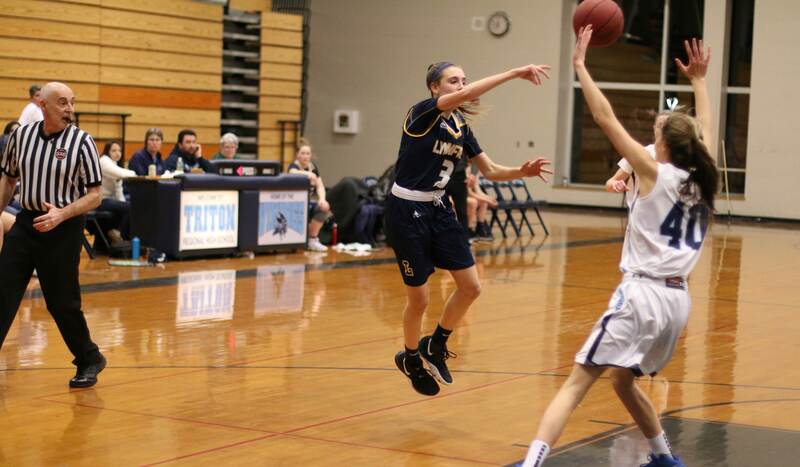 She had four layups, a free throw, and even a three. 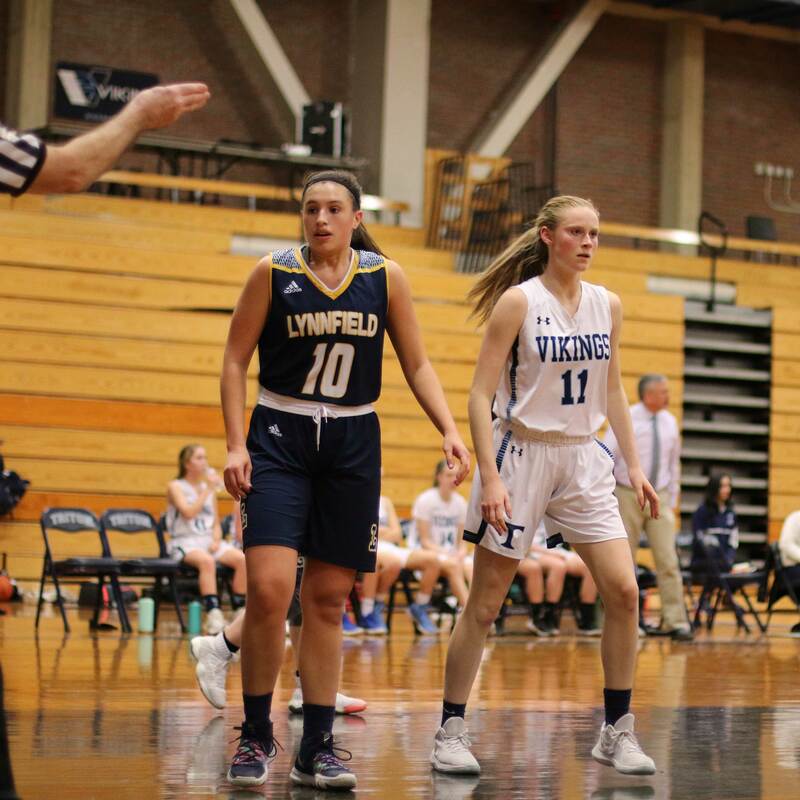 The adjustment worked because Flannery saw multiple defenders in the second half and ended up with just one free throw. 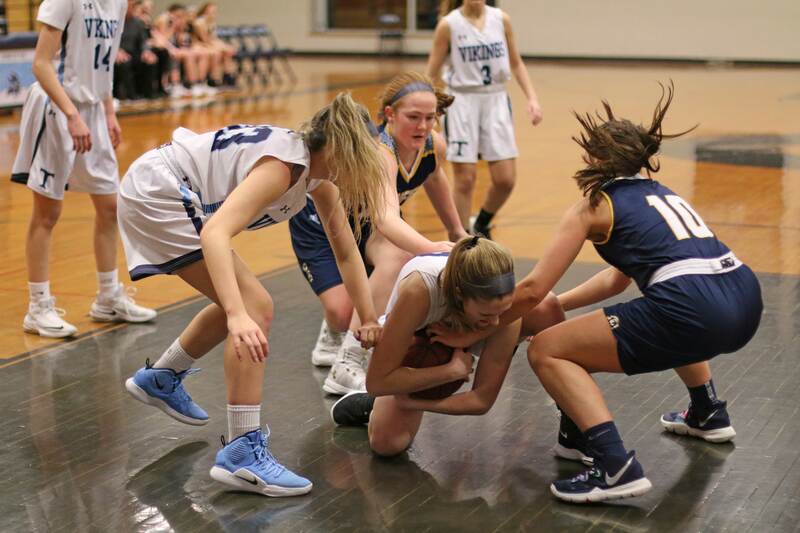 The other noticeable defensive effort was Maddie Doyle covering Alli Napoli. 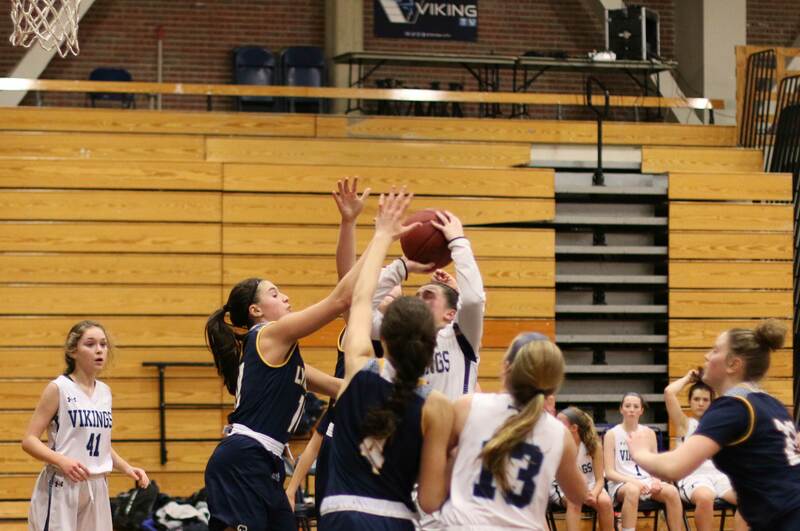 Significant size difference but Maddie kept the athletic Alli from direct routes to the basket. Alli had one full-court layup in the 2nd half. 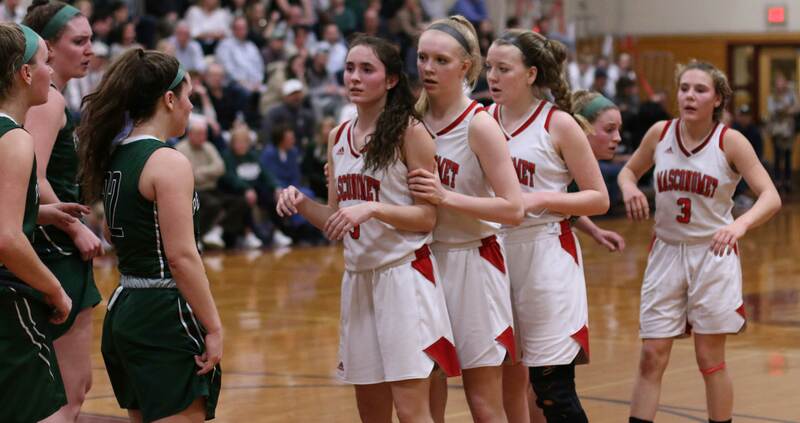 How did Amesbury stay with Pentucket in the second half if Flannery and Alli weren’t putting up points? Solid man-to-man defense and terrific rebounding. 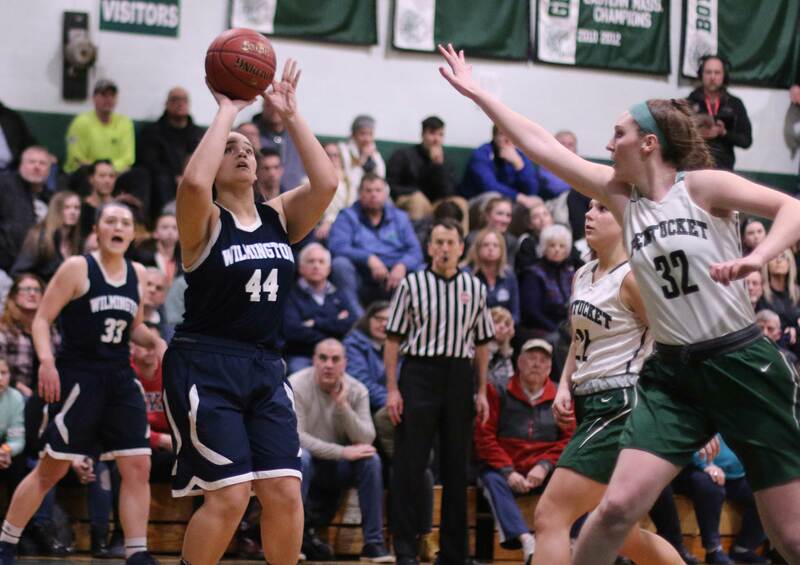 The Sachems had only one rebound basket the whole game – Arielle Cleveland at the very end of the first half. 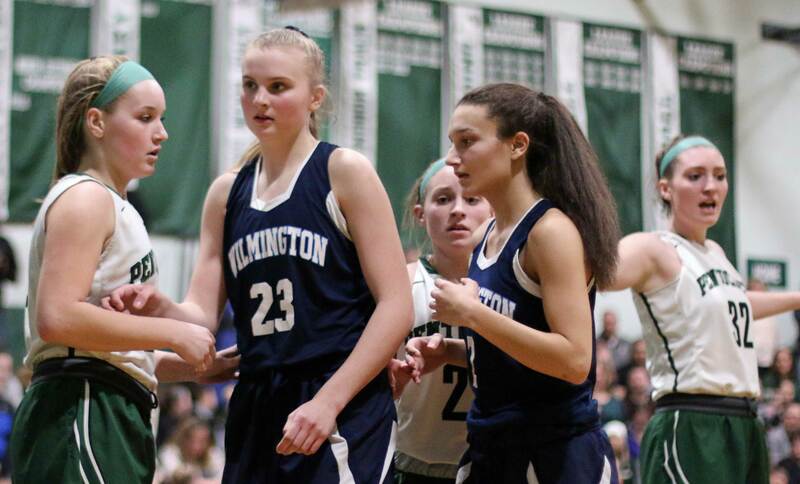 “We wanted to stop fast breaks and second-chance points,” explained Coach Dollos. The Indians led 24-17 at the 6:15 mark of the second quarter. The next three minutes? All Pentucket. 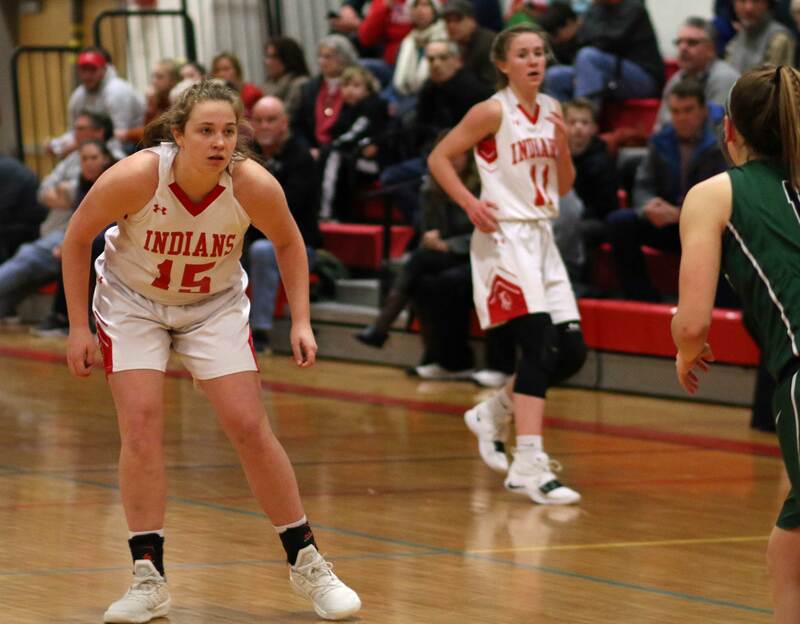 While the Indians were defended into five turnovers, the Sachems put nine unanswered points together to take their first lead, 26-24. 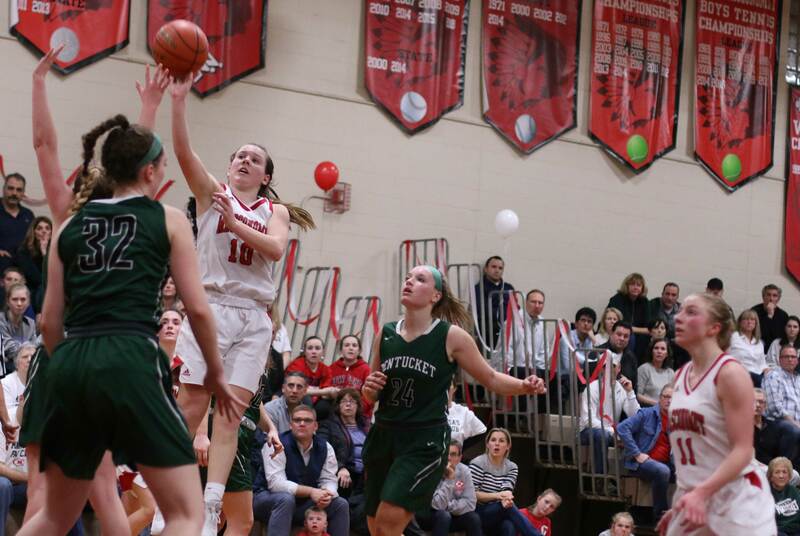 Maddie Doyle and Angelina Yacubacci finished the nine-point comeback with 3’s. I thought at the time that this might be the beginning of a long evening for the Indians, but I was wrong. 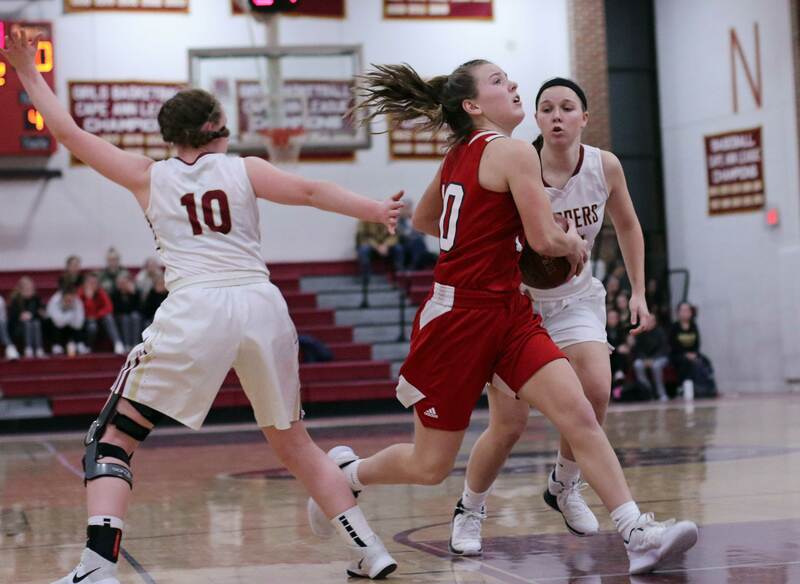 Amesbury began to answer with points and “back-and-forth” was what we witnessed the exciting rest of the way. 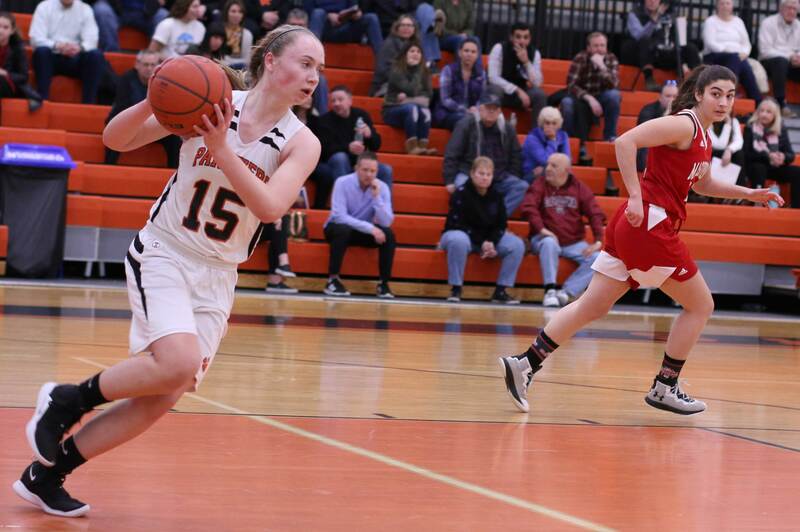 Ciara Sullivan gave Amesbury a quick 43-38 lead with five straight points to start the final quarter. 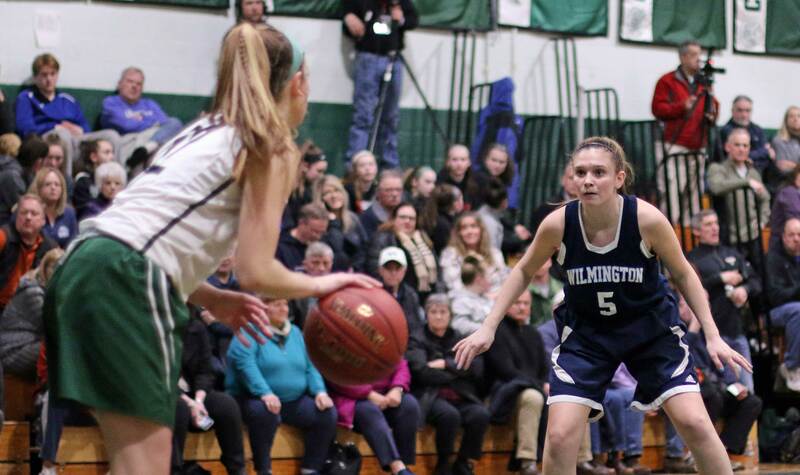 Back came Pentucket, however, with two Angelica Hurley layups and two Liv Cross free throws. It was all part of that back-and-forth thing. 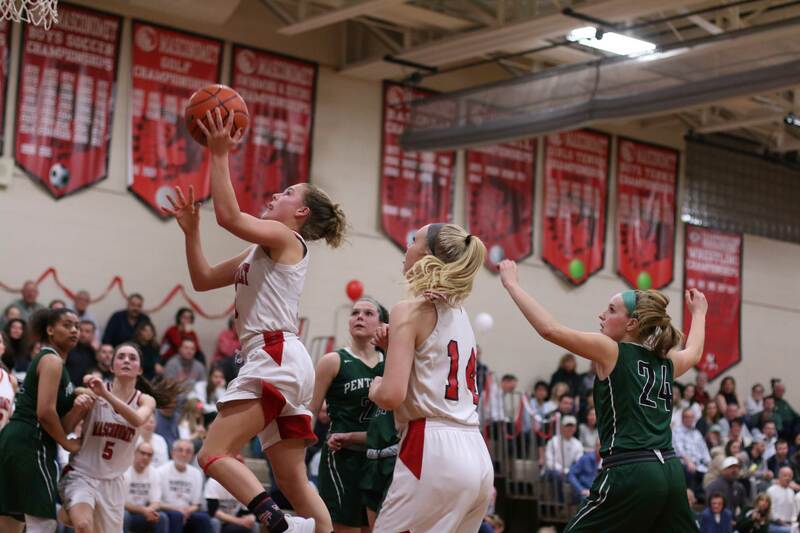 Amesbury had twenty-three turnovers and Pentucket nineteen. The 3-minute collection of five of them in the second period may well have cost Amesbury the game. Credit the Pentucket defense. 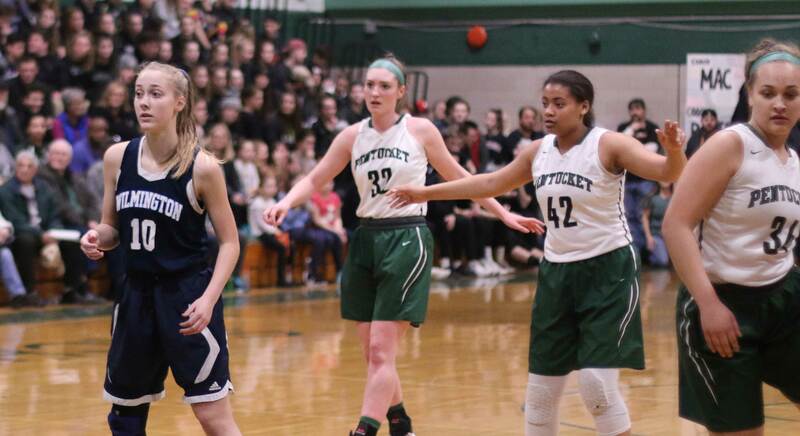 Angelica Hurley had twelve points for Pentucket and teammate Arielle Cleveland added eleven. 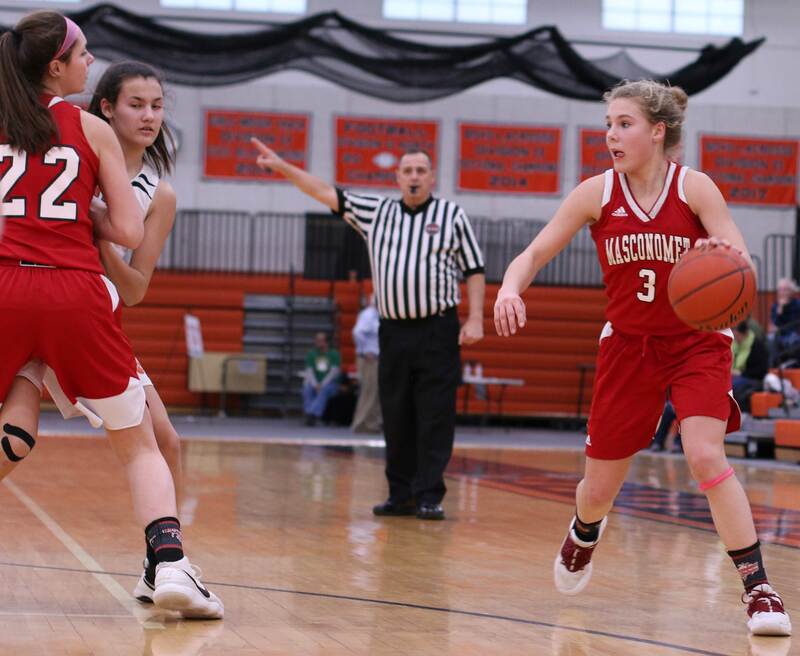 Alli Napoli collected ten points for Amesbury. 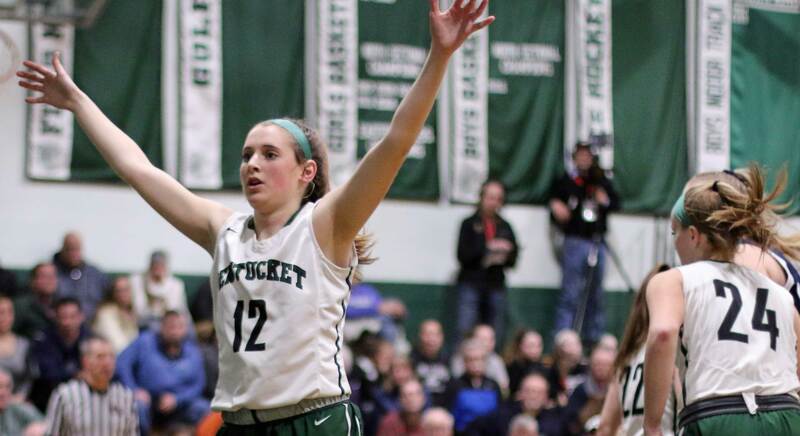 The victory extends the Pentucket winning streak to eleven. 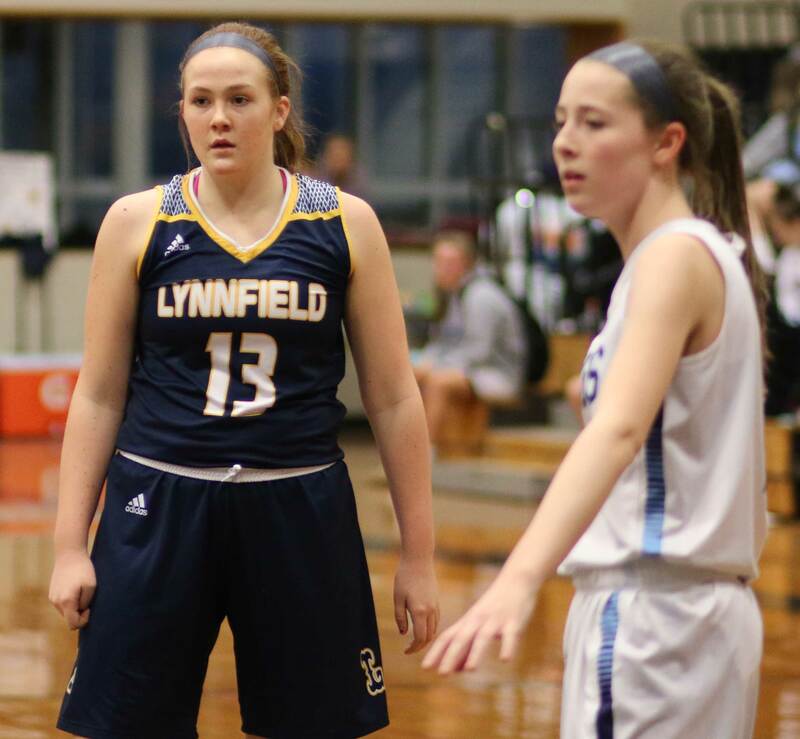 Only loss was to Westford Academy. 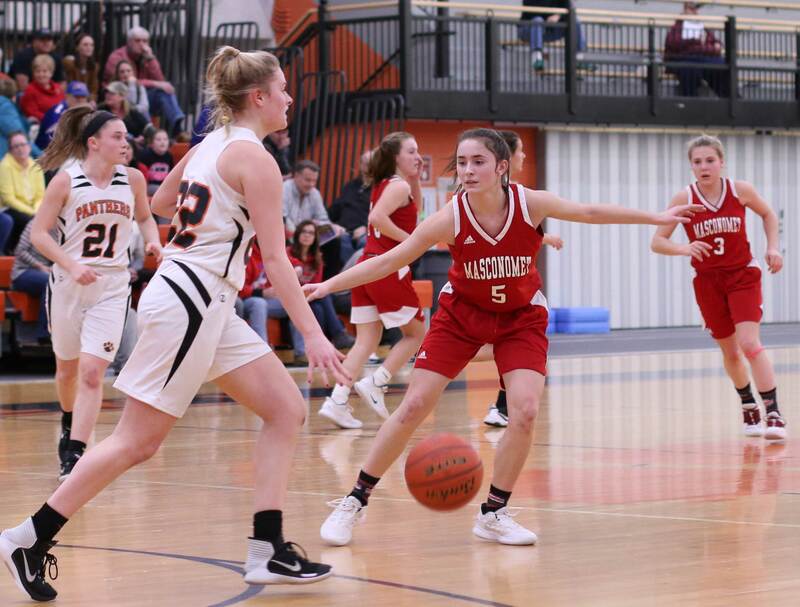 The Amesbury defeat stops their win streak at eleven. 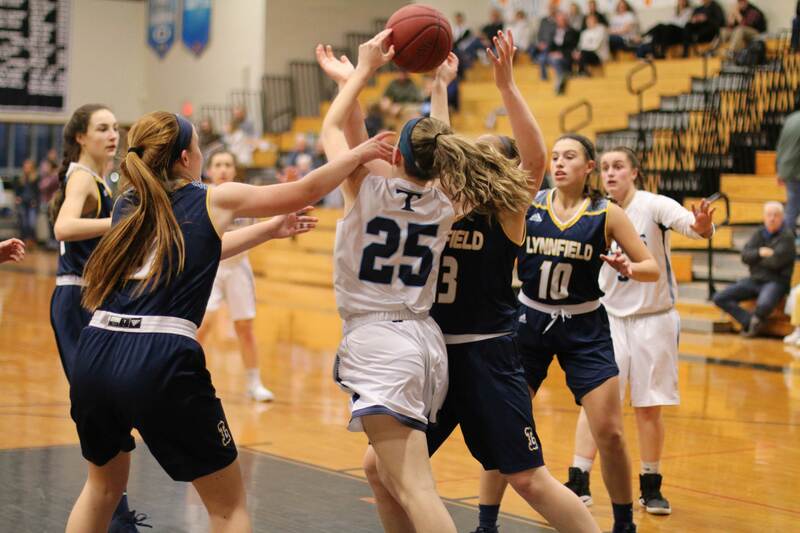 They had an early-season loss to North Reading that I covered. The intensity of the two coaches spread into the stands. It seemed as if every whistle was challenged by the side whistled against.